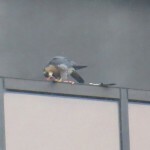 After finding no falcons from Seth Green Dr. 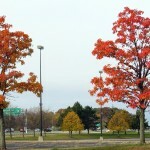 I drove over to East Ridge Rd. 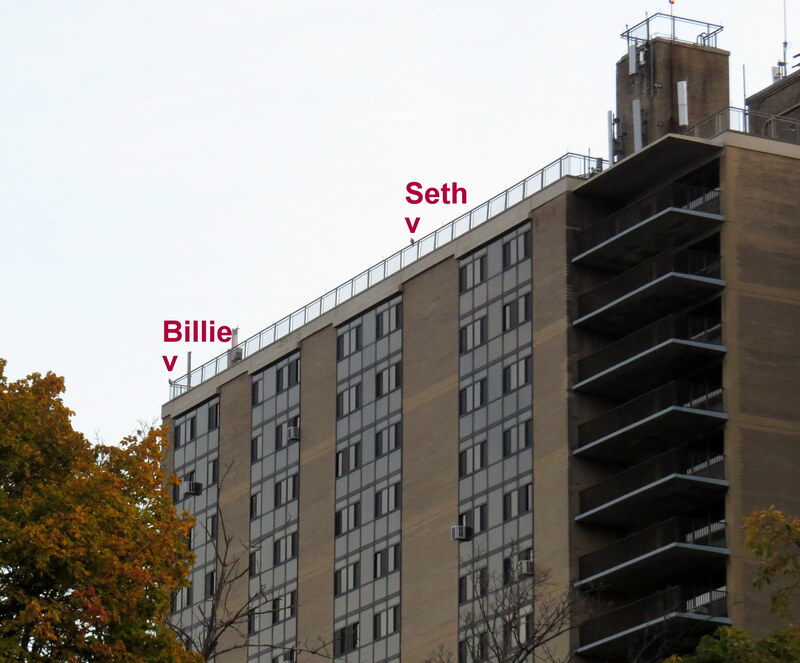 by St. Paul St. and found both Billie and Seth on the north end of Seneca Towers. 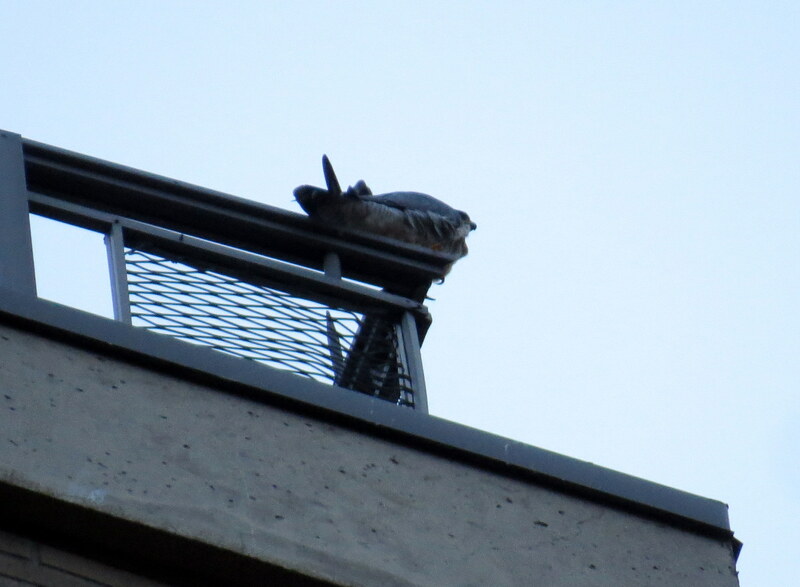 She was on the roof right above Seth who was in his spot on the window ledge. Seth was being his usual attentive self as he would look up to see if his girl was still up there every once in a while. 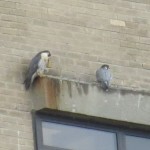 Billie was scoping out their territory as she was facing south toward Hawkeye (HE). 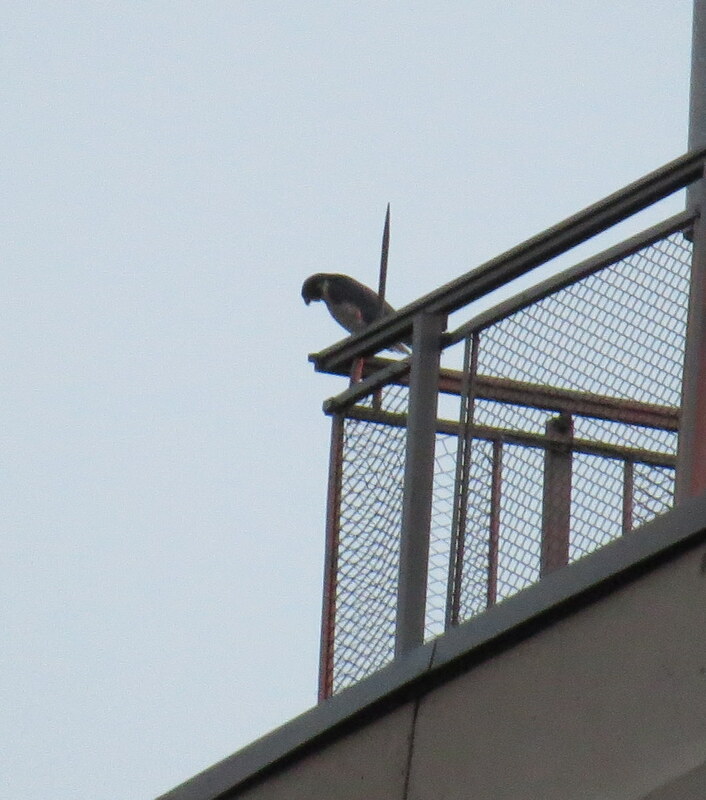 Ever since Buckee (the female from Wisconsin) came to town and started hanging out at HE I have seen Billie up on this end of the roof where she can keep tabs on the HE site. 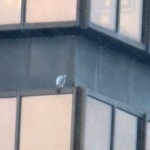 At 8:06am Buffalo Billie spread her wings and got ready to fly north. As soon as she did this Seth flew off and they both disappeared to the north over the river gorge. 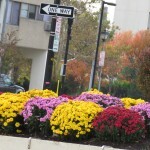 I left for downtown finding Beauty and Dot.ca (DC) pretty easily on Irving Place as I was driving down Exchange Blvd. 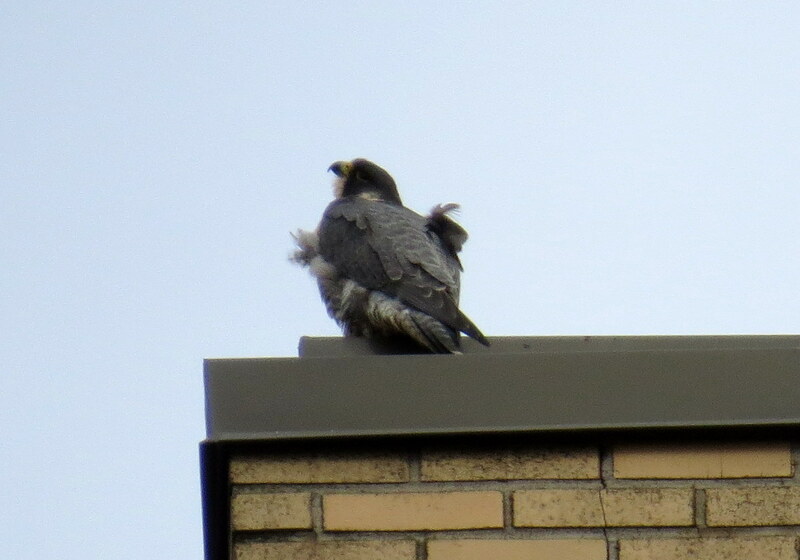 I pulled into the parking lot next to Times Square to watch as the Beautyful one was eating on a chimney and DC below her on the roof. 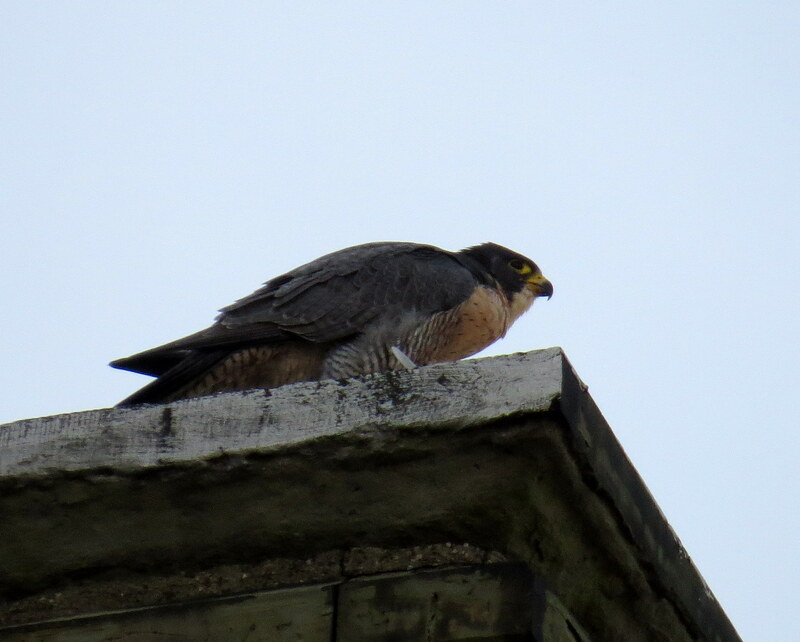 A few minutes later DC flew off and chased a pigeon and a few little birds, circling Widows Walk (WW) twice before coming to rest on the lower section northeast corner of WW. 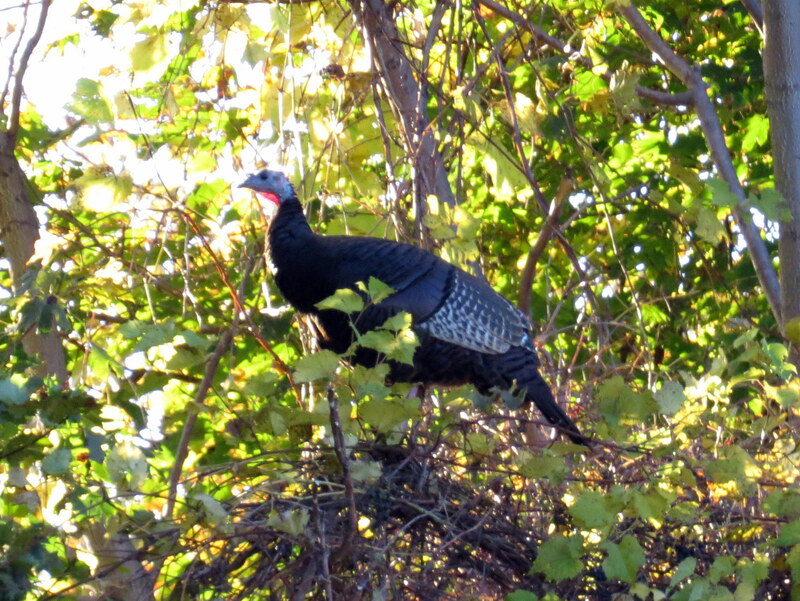 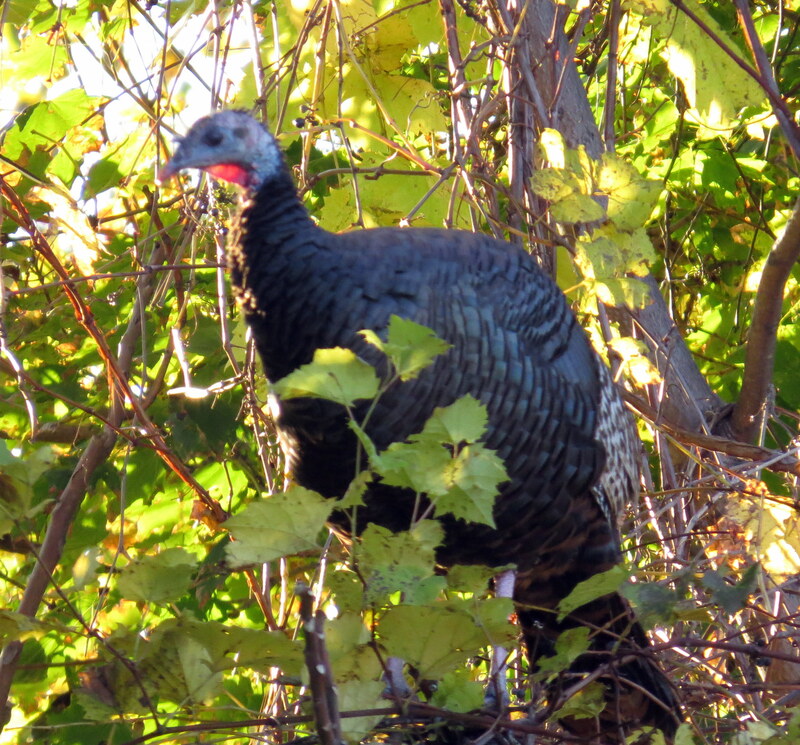 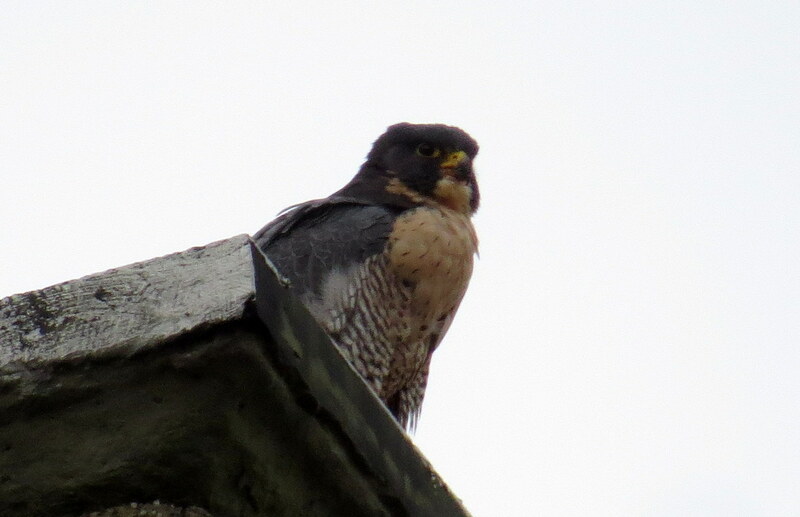 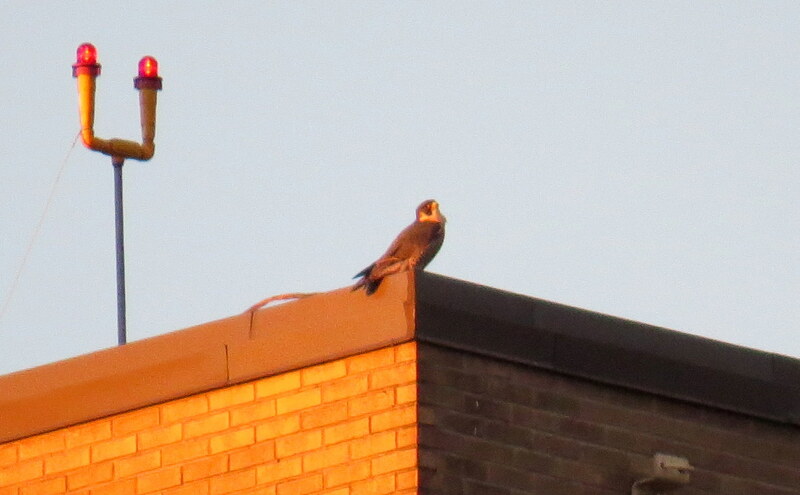 He continued to keep an eye on birds below him and Beauty who just kept filling her crop over on Irving Place. 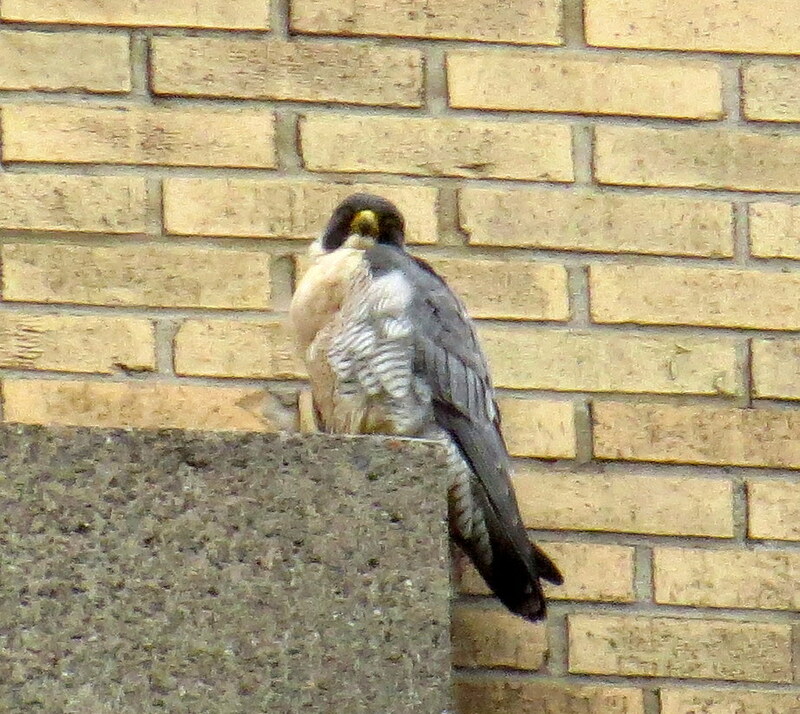 At 8:57am DC flew back to Irving Place below Beauty for a few minutes probably wishing she would leave him some scraps. 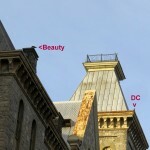 Beauty continued to eat as DC decided to go back over to WW where he could see things better while Beauty continued to fill her already full crop. 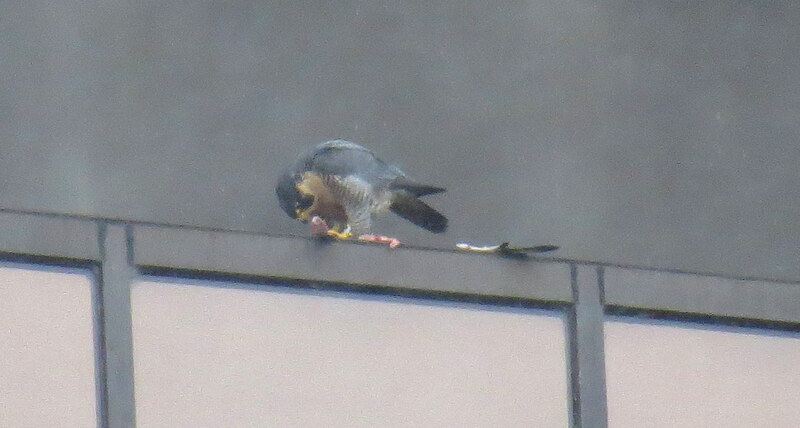 Beauty finally finished eating and 5 minutes later at 9:13am she and DC flew north out of sight. 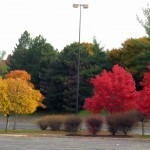 I went north as well but never found them so off to the Medley Center I went. 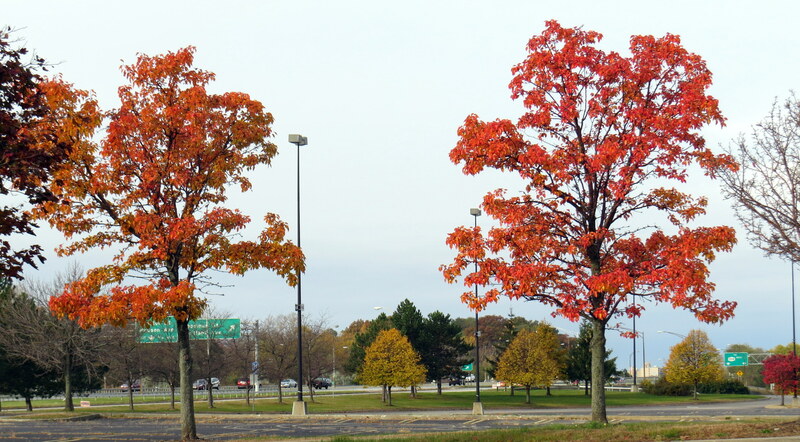 I didn’t find any falcons there but there were still some nice fall colors in the parking lot trees. 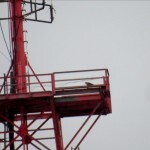 Nothing seen at HE on the way there. 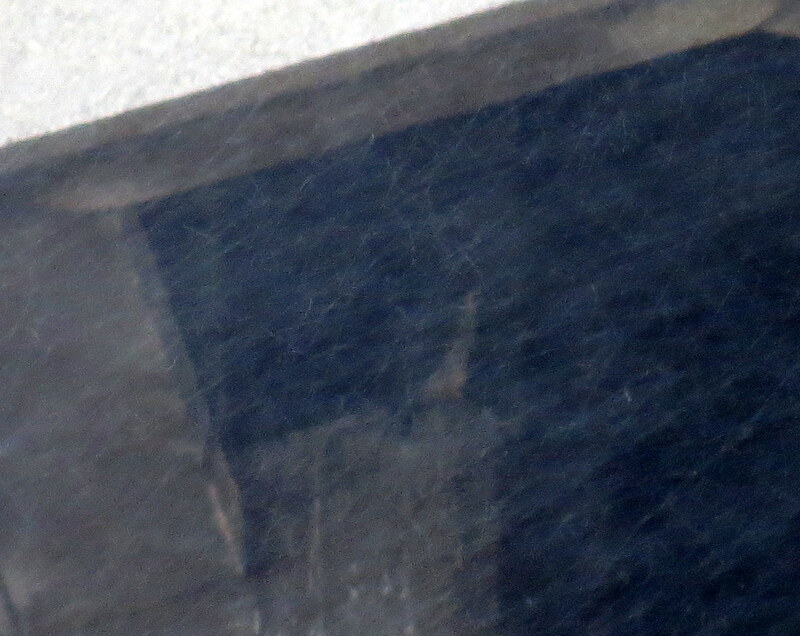 When I got home to Seneca Towers nobody was home so I ended my watch at 9:50am. 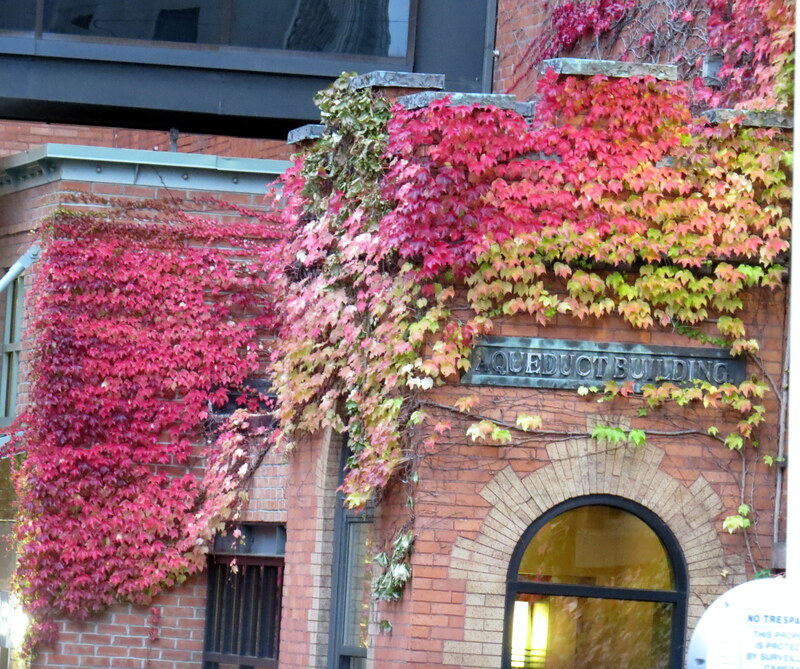 Keep smiling everyone! 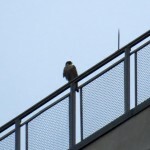 I started out on Seth Green Dr. at 7:45am with a falcon on the northwest corner of the railing. 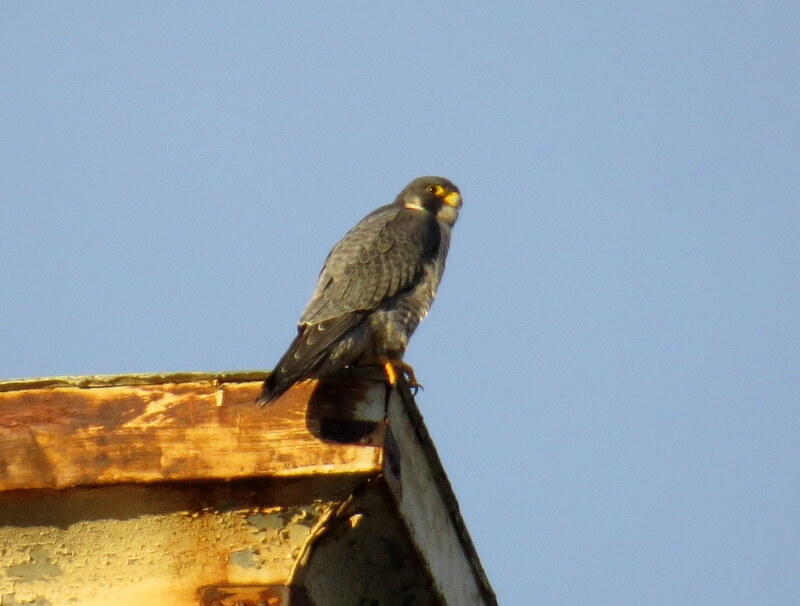 Wasn’t sure who it was until I drove over to East Ridge Rd. 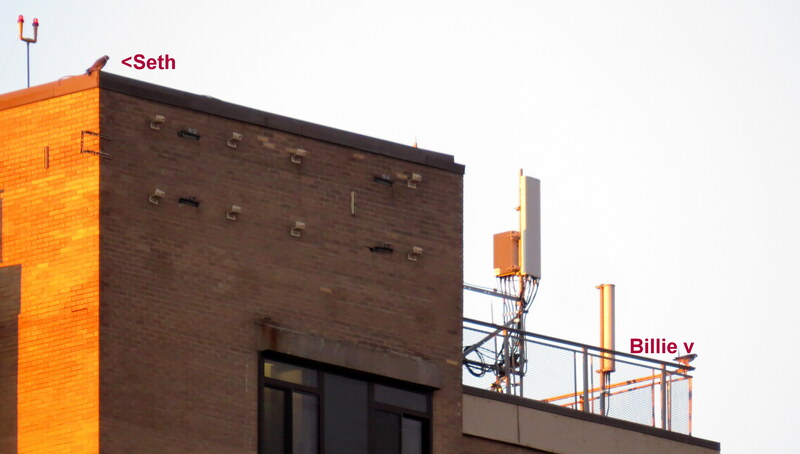 where I could see it was Billie there and Seth on the north end of the roof above her. 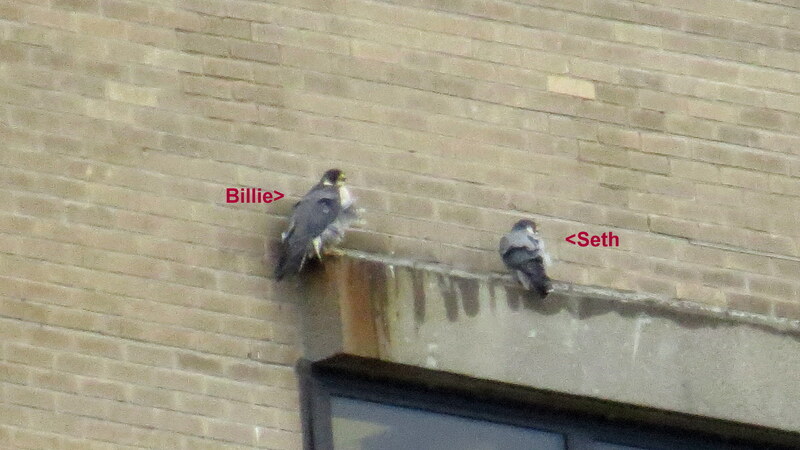 They took off at 7:52am to the north over the river-Billie left first immediately followed by Seth. 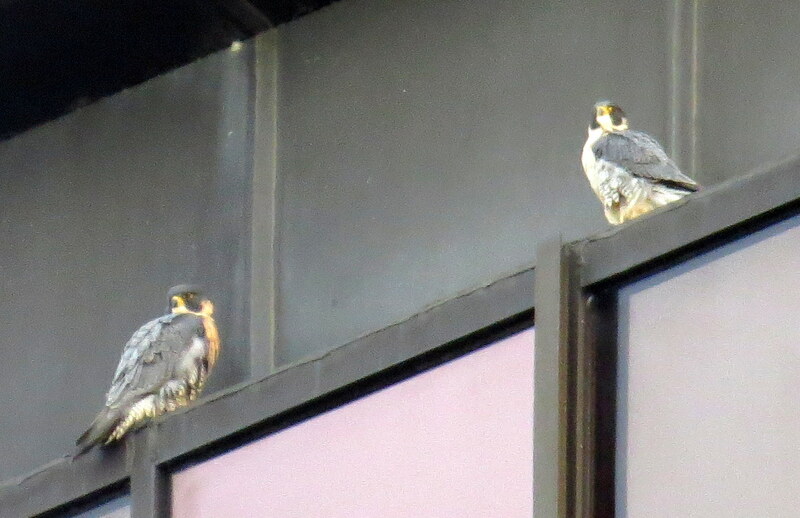 They didn’t return so I headed downtown. I spotted Beauty on the top I-beam south corner of OCSR from the Broad St. bridge then I went down in the hole on Aqueduct St. for a closer look. 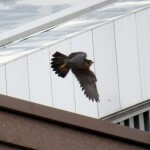 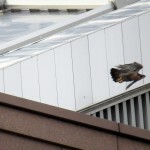 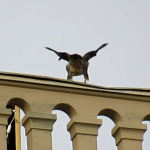 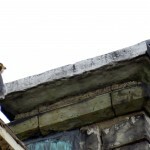 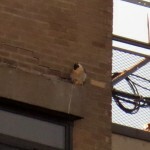 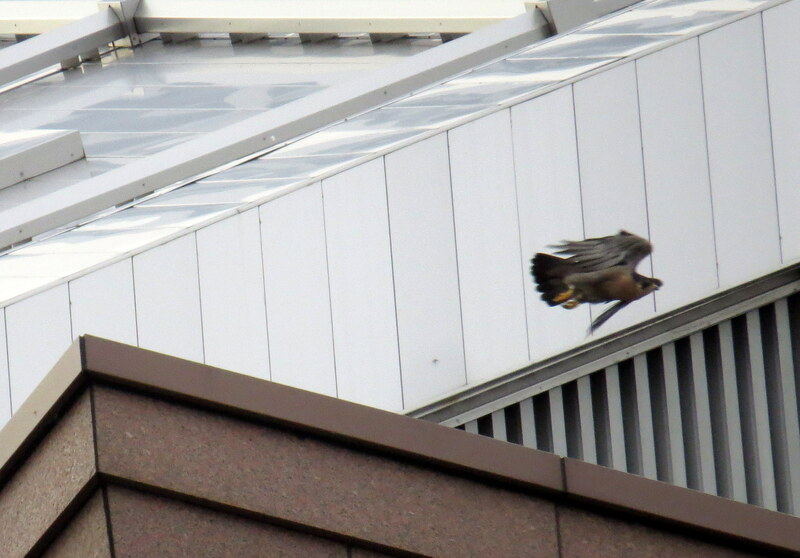 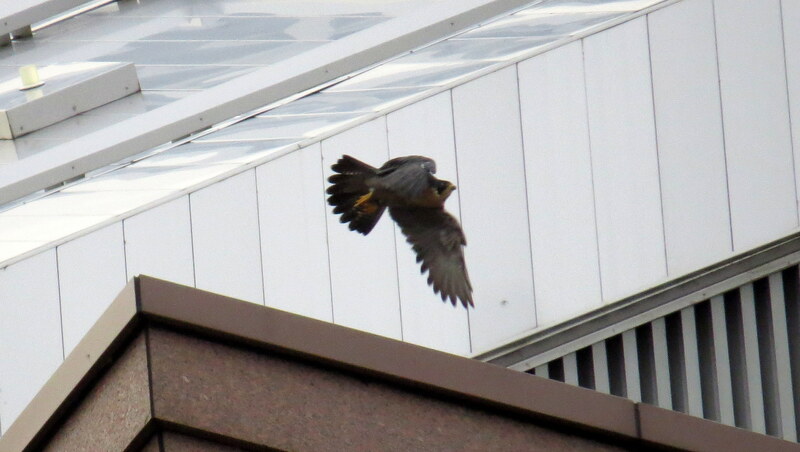 I believe she was looking for Dot.ca (DC) and at around 8:30am she flew over to the east side railing of the Powers building. 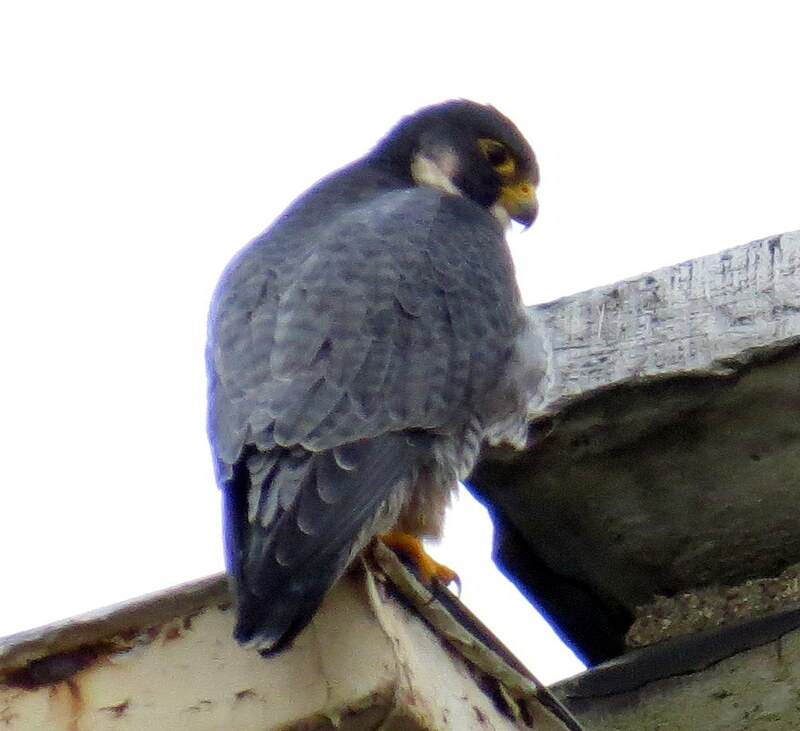 I went down to the end of Aqueduct St. at Main St. where I could see her but not the nest box. 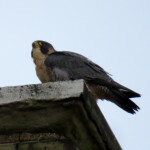 I found out later that DC was in the nest box-I thought so at the time because the Beautyful one bowed once before taking off and I caught a glimpse of him following behind her. 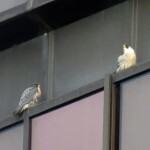 I looked for them but didn’t find them again so I headed over to the Medley Center-no sightings there or at Hawkeye so I went home to Seneca Towers. 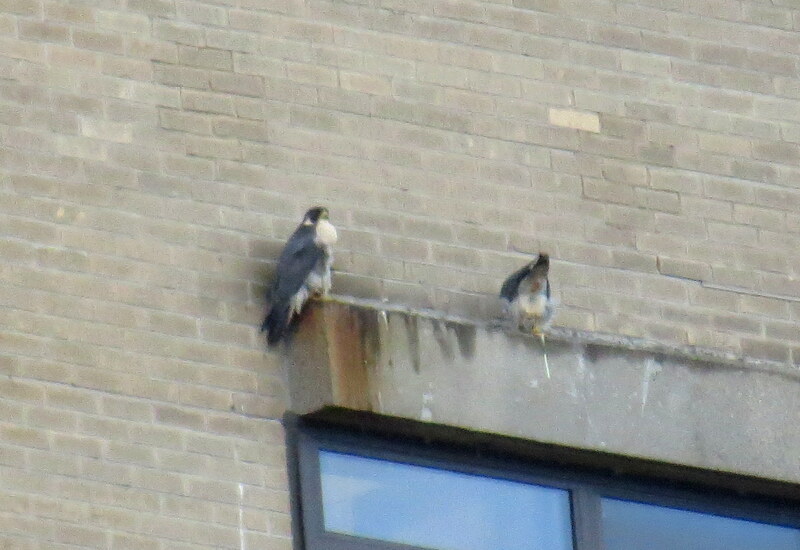 Stopping first on Seth Green Dr. then to the south end of my parking lot to watch Seth on the south window ledge and Billie on the southwest corner of the roof. 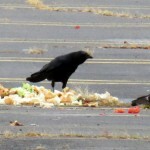 They both had food in their crops. 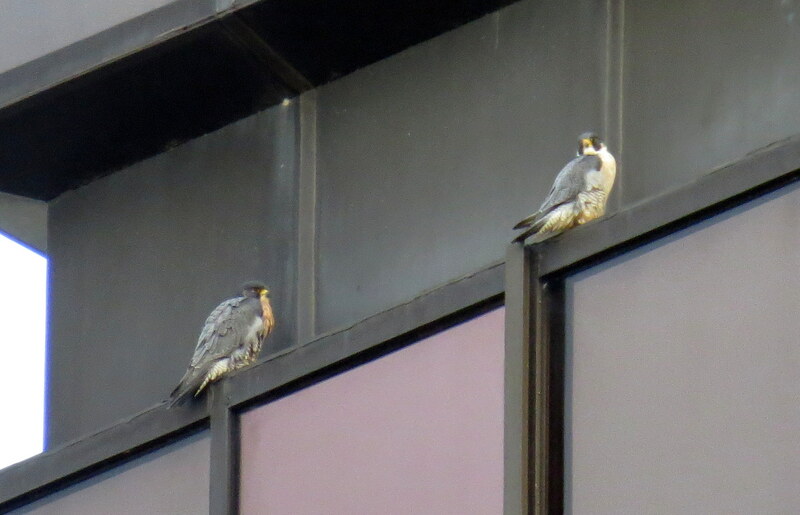 They were keeping an eye on their territory as the sun started to shine thru the clouds. 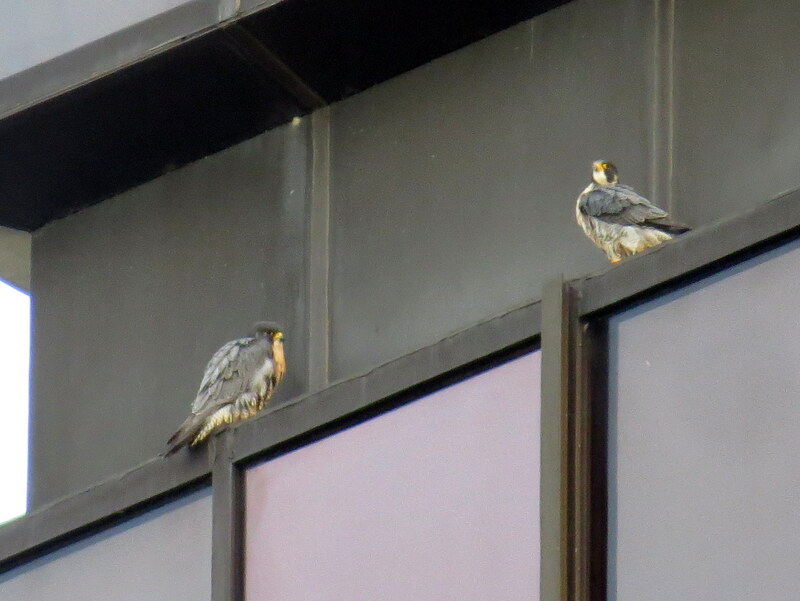 I left them to it, ending my watch at 10:15am smiling after a successful falcon watch in which I saw our 2 Rochester Peregrine Falcon pairs! 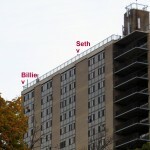 I found Seth on the west side railing of Seneca Towers from Seth Green Dr. then I drove to East Ridge Rd. 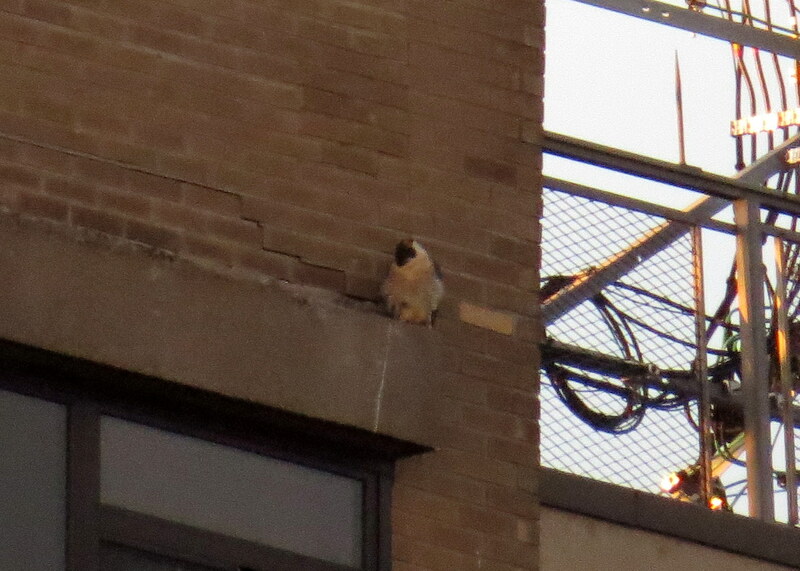 just in time to see Billie fly off the north window ledge and go into a stoop down in the river gorge. I left for downtown when she didn’t come back. 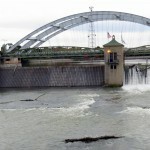 As I arrived on the Andrews St. bridge it started raining. 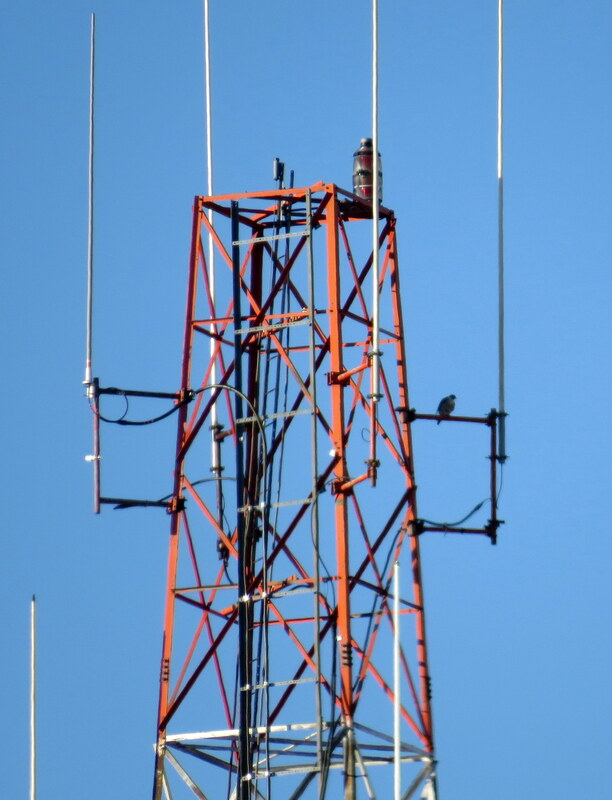 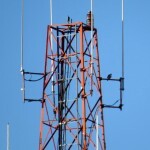 I spotted Beauty on the Frontier Communications tower (FCT) platform eating and Dot.ca on the top I-beam north corner of OCSR. 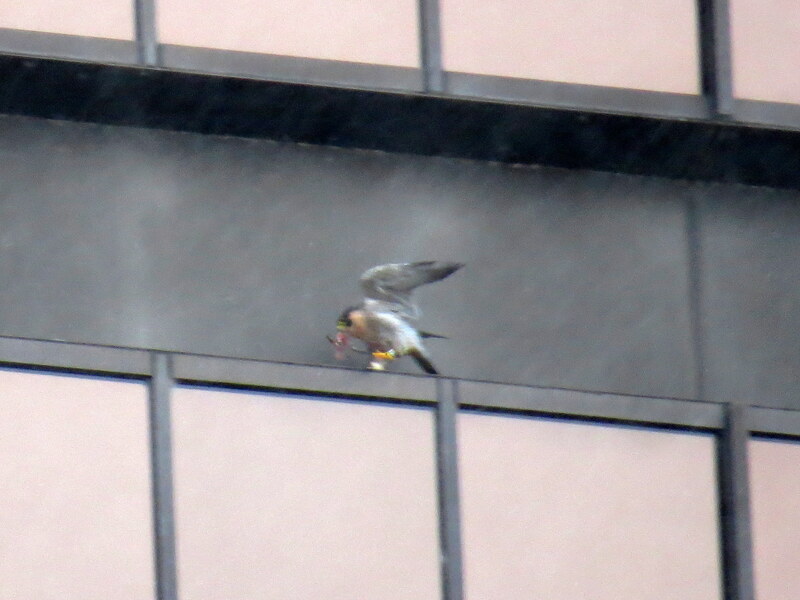 A few minutes later the rain started coming down in sheets and DC left at that time for the OCSR elevator shaft. 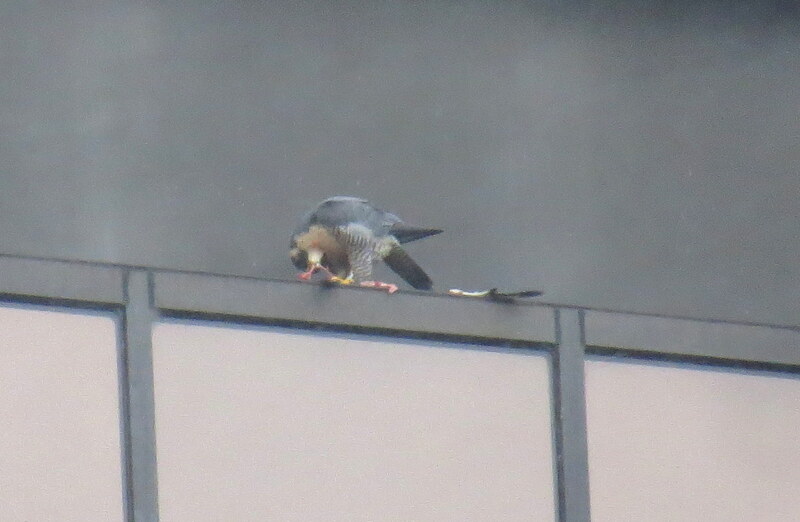 The Beautyful one kept eating for a few more minutes and then she couldn’t take it any more either-she flew off with the remains to the top I-beam northeast side of OCSR to finish her meal. 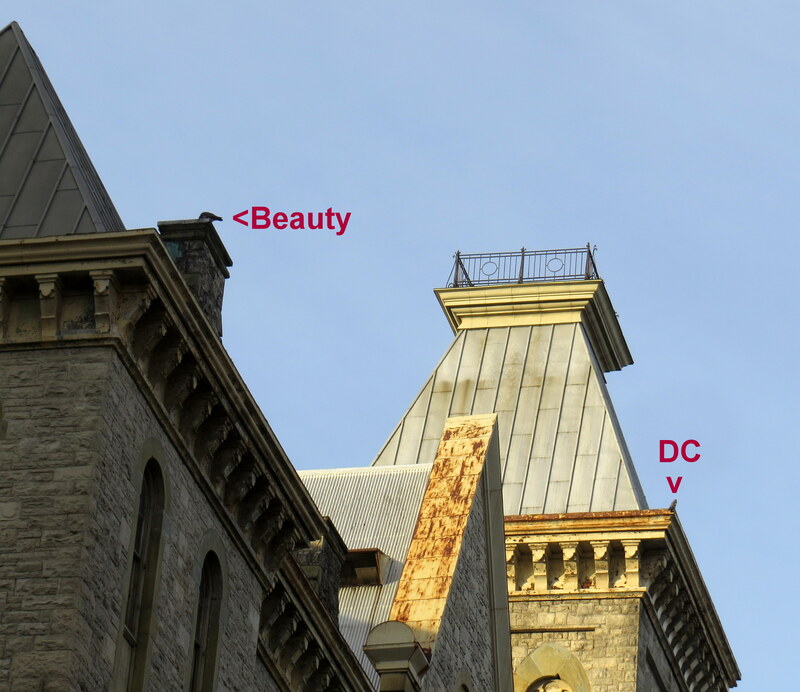 I went over to Bragdon Place by the Radisson Hotel where I could see DC on the south ledge of the elevator shaft and Beauty. 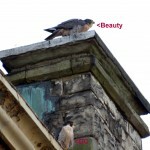 Beauty had a few different pieces that she picked at and while I was taping a video of her one of those pieces fell off the I-beam. 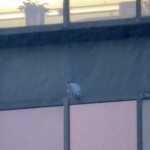 I believe she was having a little trouble keeping the wind from blowing the rest of it off as well. 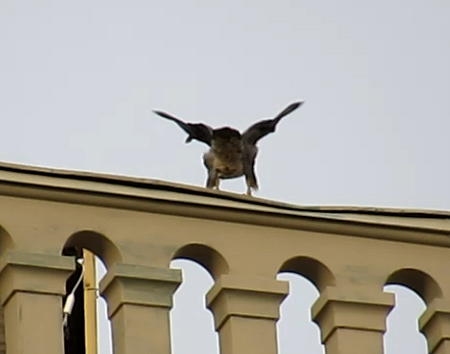 She turned around and moved over a couple times before finishing up. 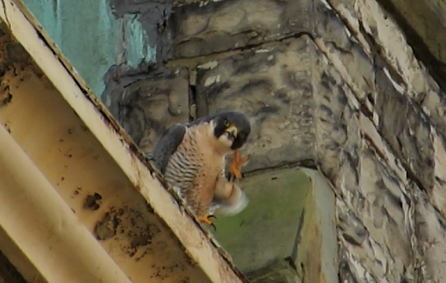 Beauty finished eating then cleaned herself up before pooping and turning her back to me. 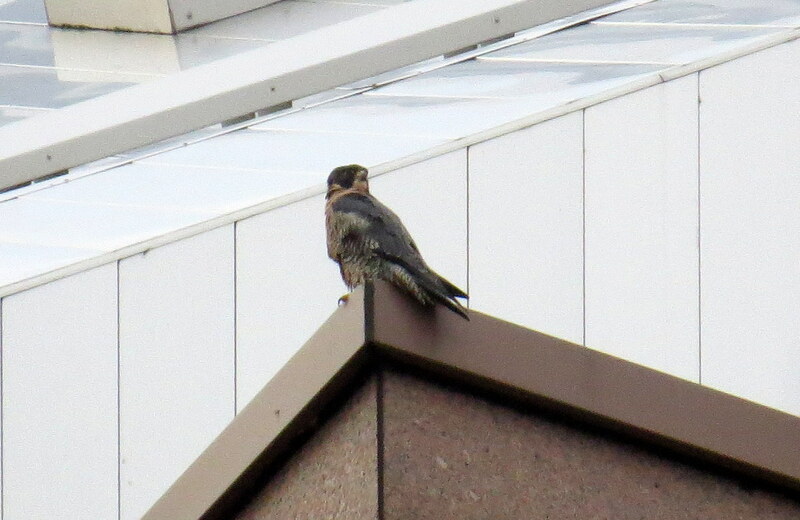 I kept expecting her to fly over to the elevator shaft to join DC but she didn’t while I was still there. 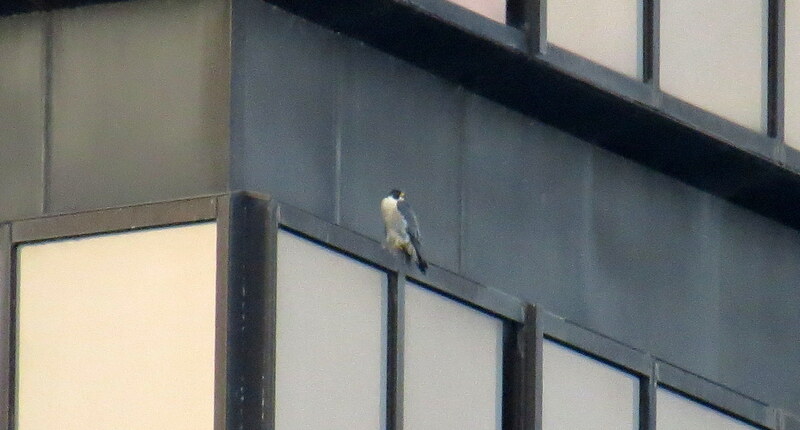 I left downtown around 8:45am to check the Medley Center but I had no luck finding anyone there. 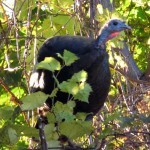 I then drove to my spot on East Ridge Rd. 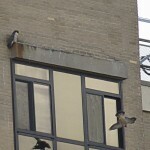 by St. Paul St. to watch the love birds Billie and Seth who were on the north window ledge very close to each other. 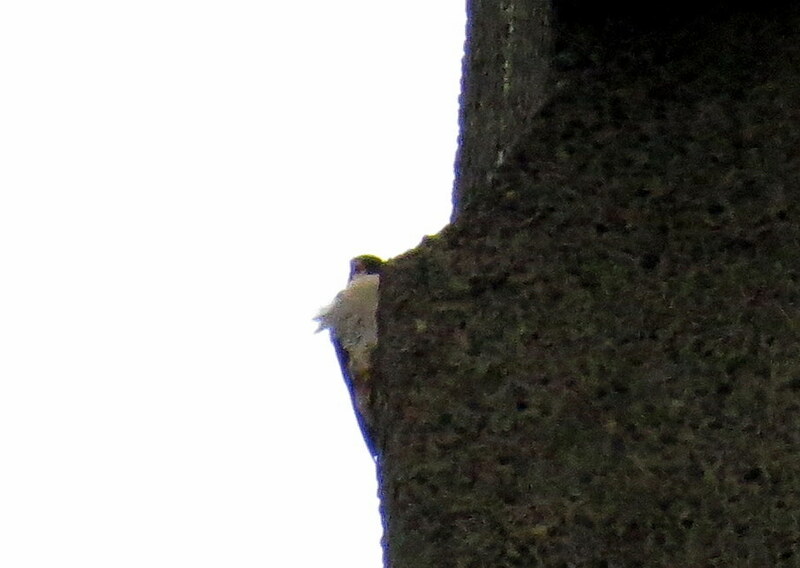 Billie had a very full crop so I’d have to say she caught something earlier when I saw her stoop into the gorge. 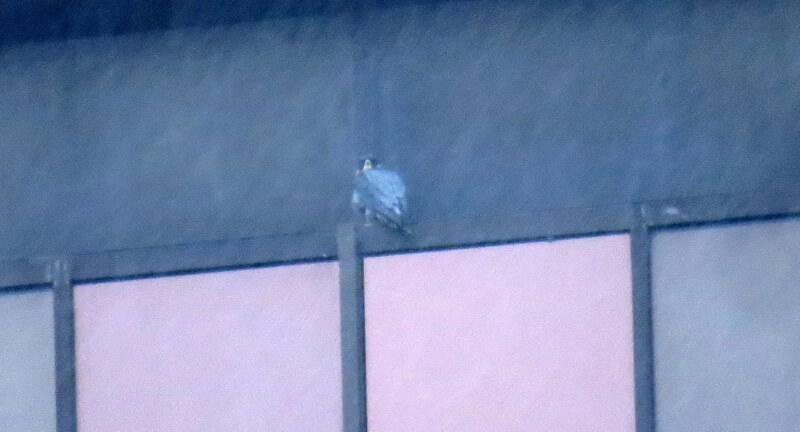 Seth flew off at 9:33am heading north over the river and eventually disappearing behind trees. 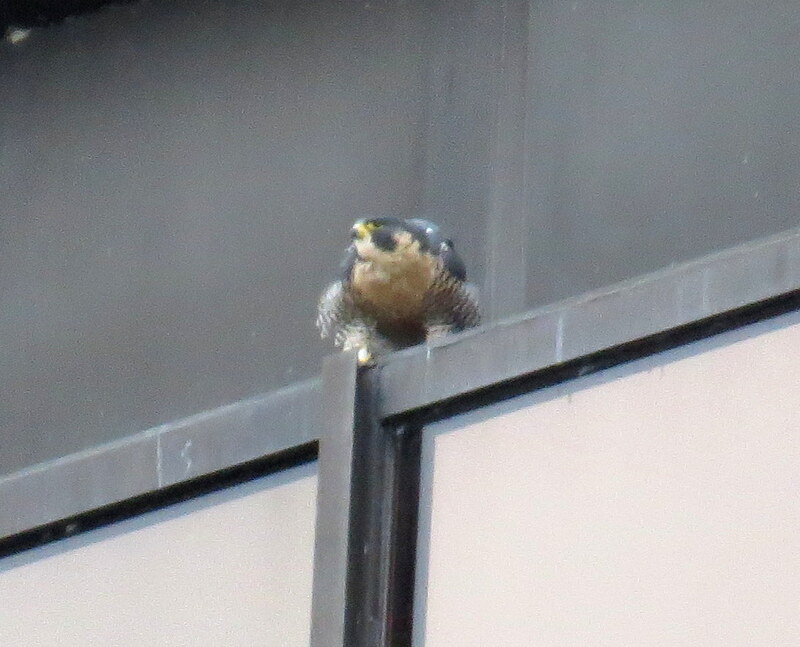 I was very happy to end my watch at about 9:45am with a smile after having seen our downtown and Seneca Towers pairs of Peregrine Falcons doing well! 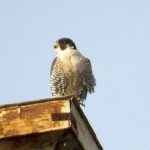 After a day off yesterday due to car trouble I was ready to get out there this morning and find falcons. 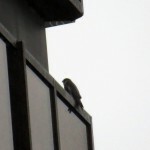 The weather had other plans for me as there were no falcons seen at Seneca Towers (ST) or Hawkeye (HE) I’m sure because they were hunkered down out of the wind and rain. 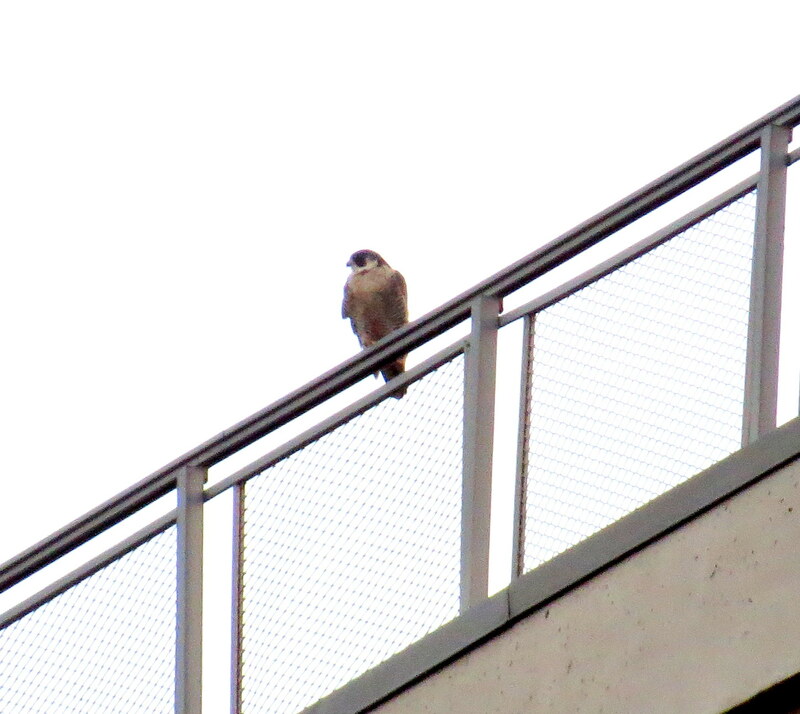 When I got downtown and pulled over on the Andrews St. bridge, I spotted Dot.ca (DC) on the 2nd I-beam north corner of OCSR with his back to me. 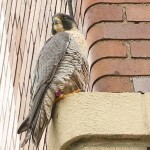 I drove around to Bragdon St. to check the south side of the OCSR elevator shaft just in case Beauty was in there but she wasn’t. 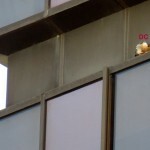 I had a closer view of DC from there but still couldn’t see the front of him. 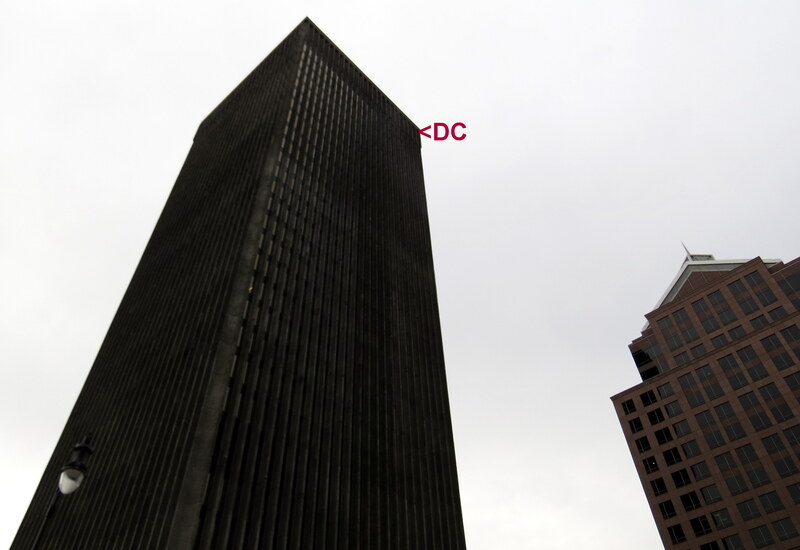 I then drove around the block to the Radisson Hotel by Main St. to check the north side of the elevator shaft and one last angle of DC. 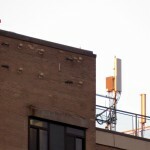 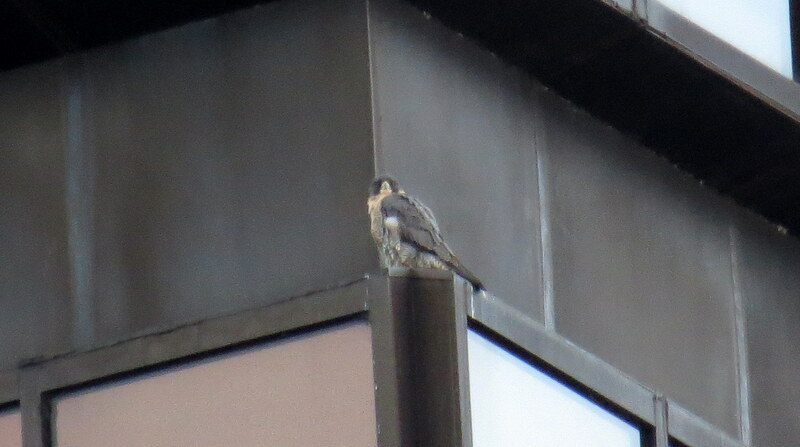 I made a trip around to the Times Square area and to the east side with no luck finding the Beautyful one until coming back down State St. where I spotted her on the northwest side of OCSR on the top I-beam around 8:30am. 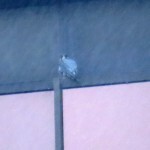 She too, had her back to the elements and me. 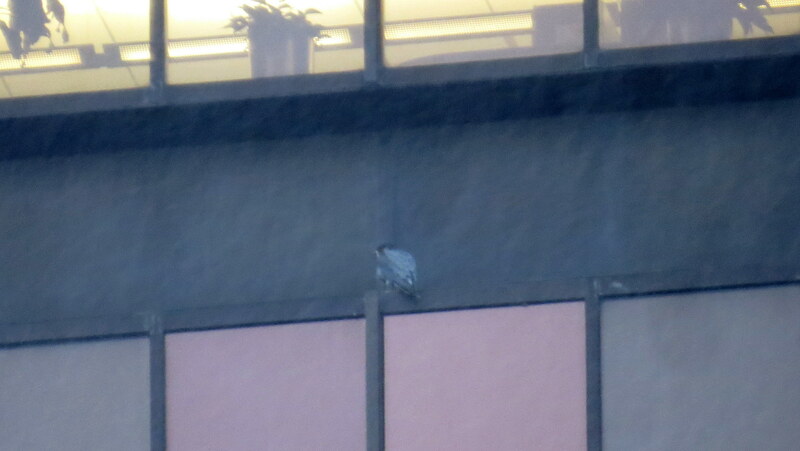 It was raining pretty hard at this time and the dark conditions made it hard to get a good photo of her. 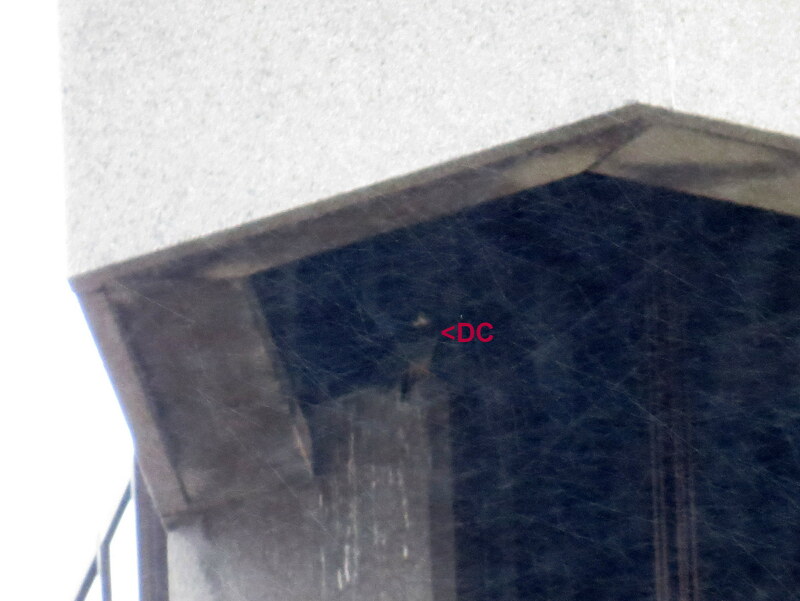 I could just barely see DC’s head from where I was when I decided to move on to check the Medley Center. 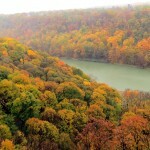 No birds of any kind were seen there but the fall colors shown thru the nasty weather conditions very well. 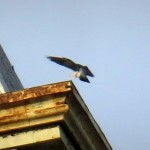 I left there and checked St. Ann’s Home and saw nothing there. 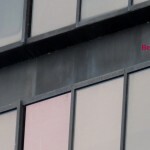 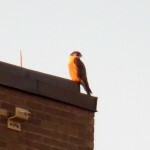 Then I checked Hawkeye again before going home to Seneca Towers-no sightings at either location. 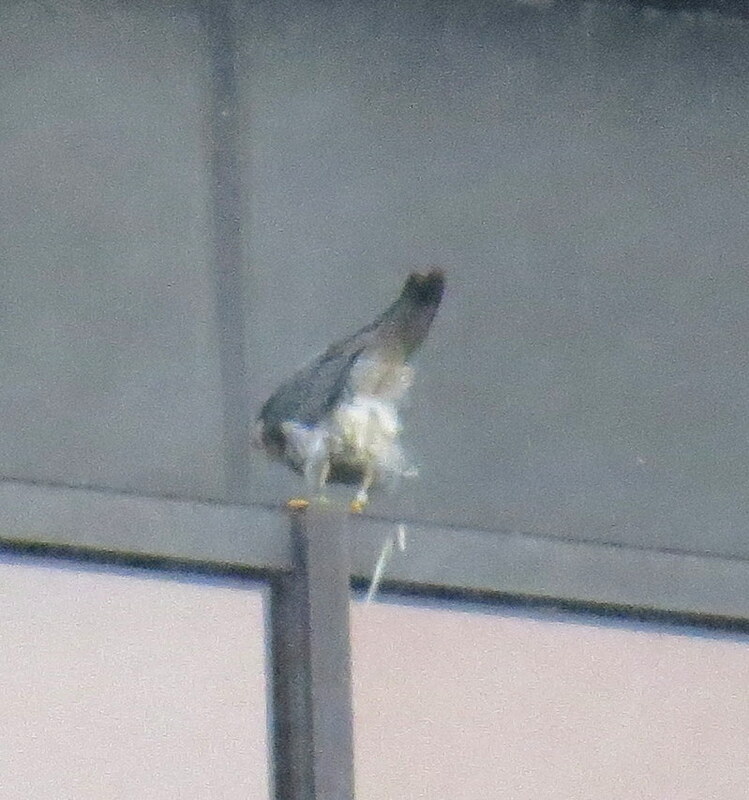 I took a couple pics from my living room window to give y’all a sense of how close the Hawkeye plant is from Seneca Towers-only a half mile. 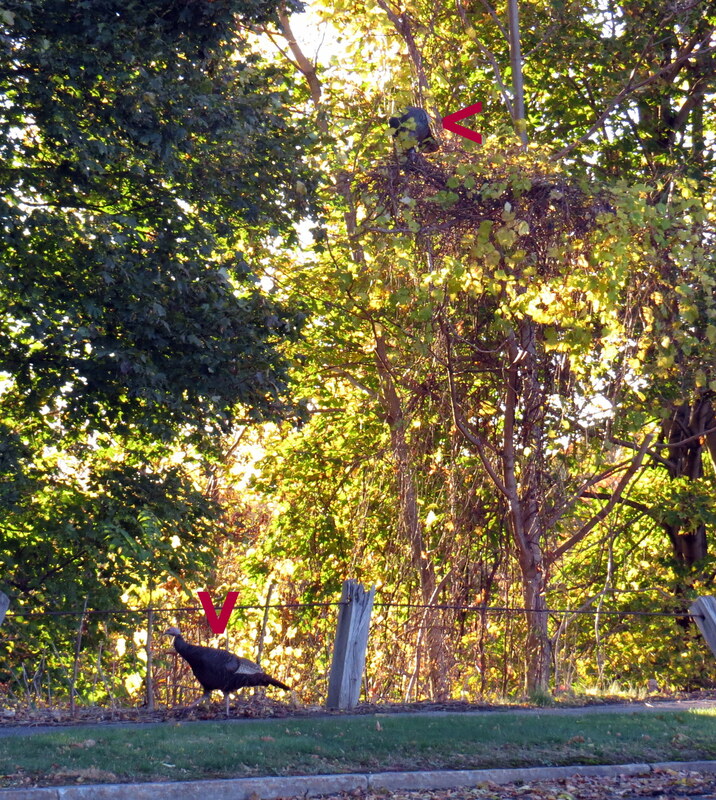 The first pic is looking southwest over the Genesee River and the second pic looking south over Seth Green Park to Hawkeye. 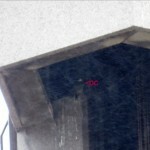 I ended my watch at a little past 9:30am smiling as I was happy to be rolling again! 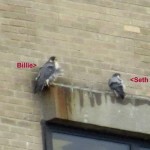 I decided to spend more time looking for Billie and Seth today since I’ve only seen one falcon at Seneca Towers in the last 4 days. 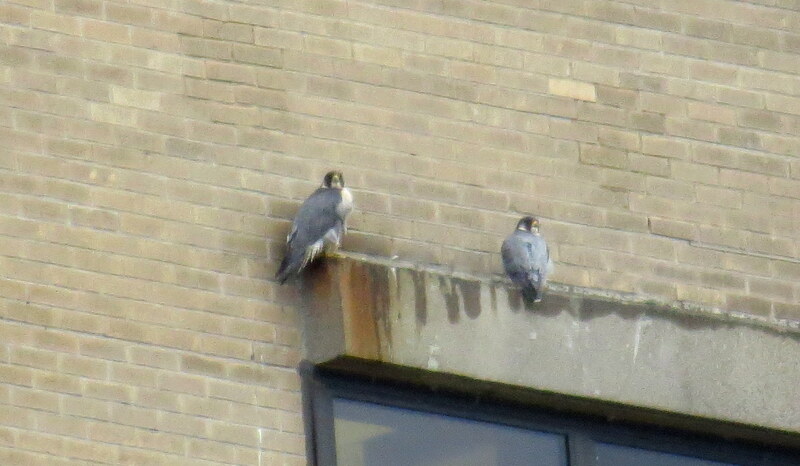 Since there had been a new pair hanging out at Hawkeye (half mile away from ST) I am a bit concerned since I haven’t seen either one of them since last week. 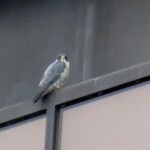 Again, I didn’t find a falcon at either location this morning in between checking the Medley Center to the east and Kodak Park on Lake Ave. to the north. 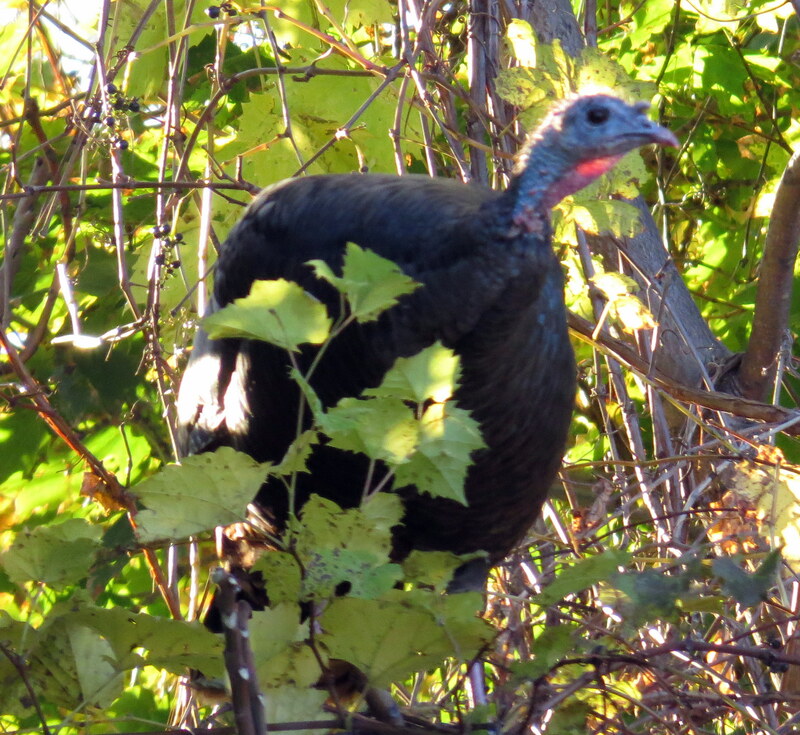 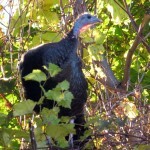 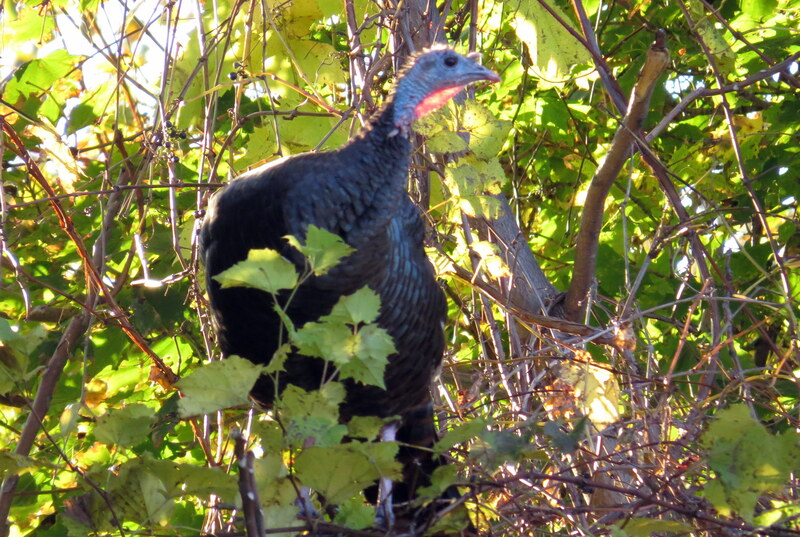 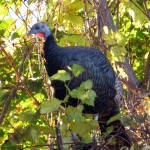 I did however, come across some wild turkeys at the top of the Genesee River gorge eating berries from a tree and on the ground. 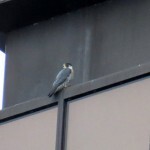 I decided to check downtown real quick then go back to ST to look some more. 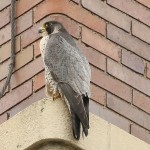 I arrived on the Broad St. bridge about 9am after an unsuccessful drive around. 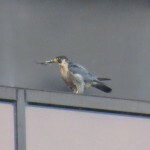 I thought I’d check out the river for a few minutes to see if anything turned up. 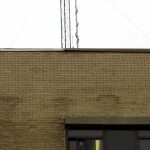 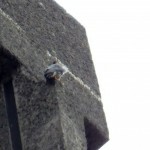 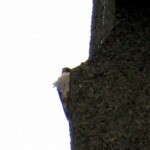 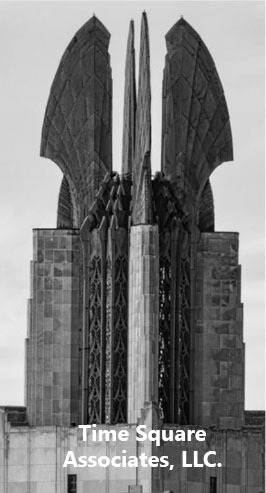 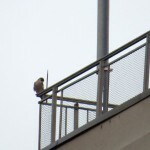 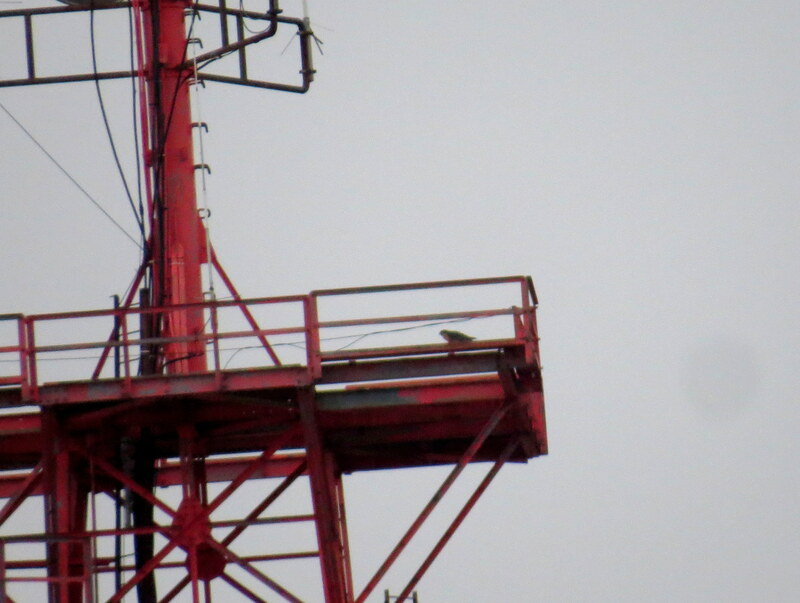 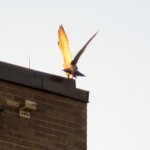 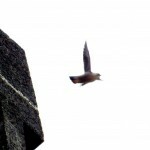 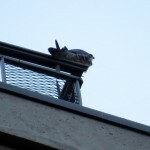 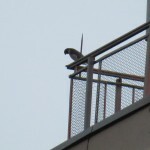 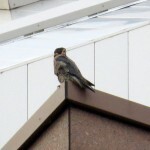 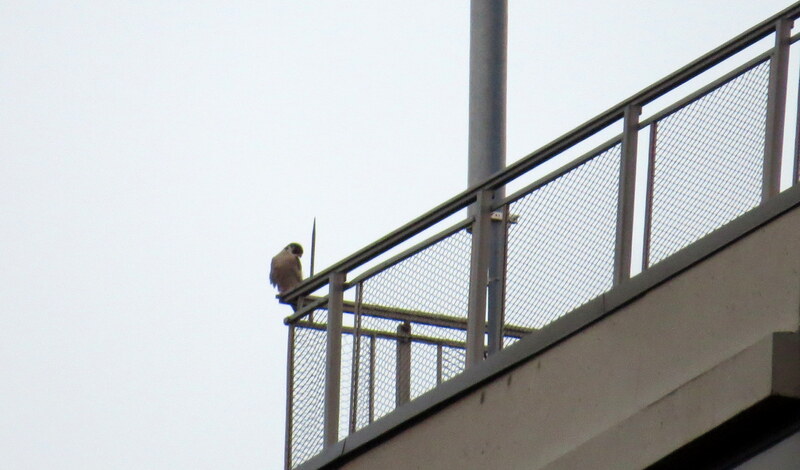 I spotted a falcon on the top arm of the jail tower but couldn’t say who it was because of the distance. 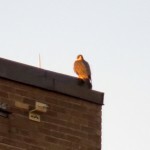 I thought I’d drive over to Troup St. for a closer look but my angel car had other ideas-it wouldn’t start. 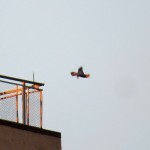 So that was the end of my watch. 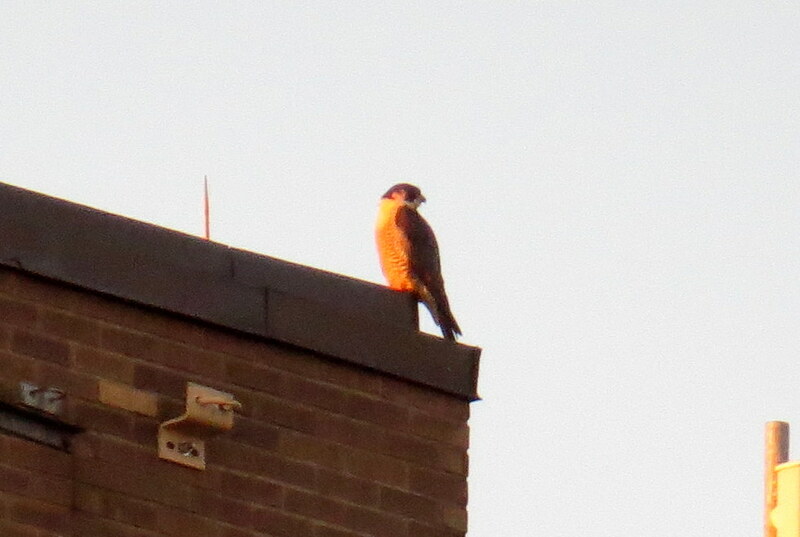 After making some phone calls I looked over to see that the falcon was gone. 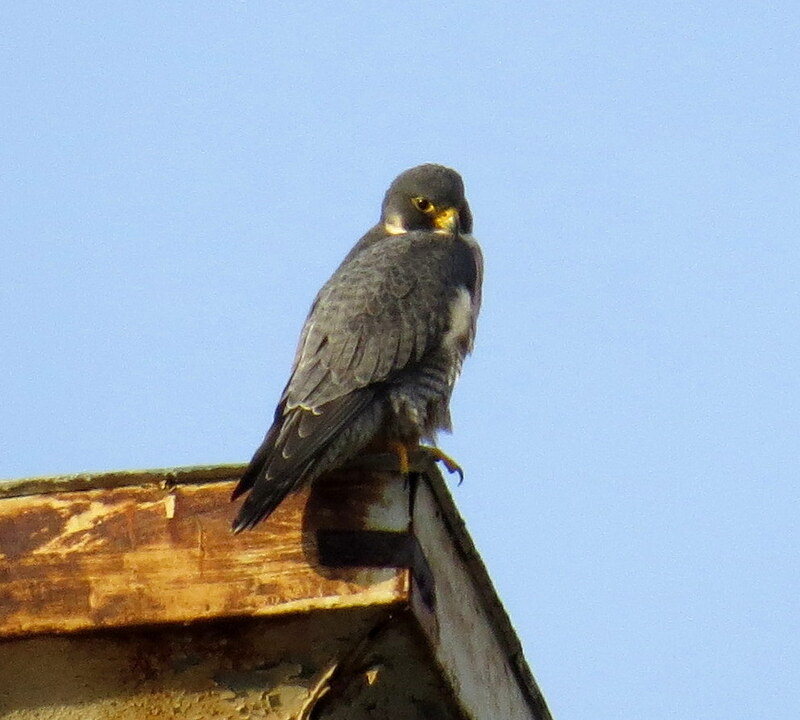 At 9:12am I got a couple tweets from Donna that Beauty and Dot.ca were at the Powers nest site. 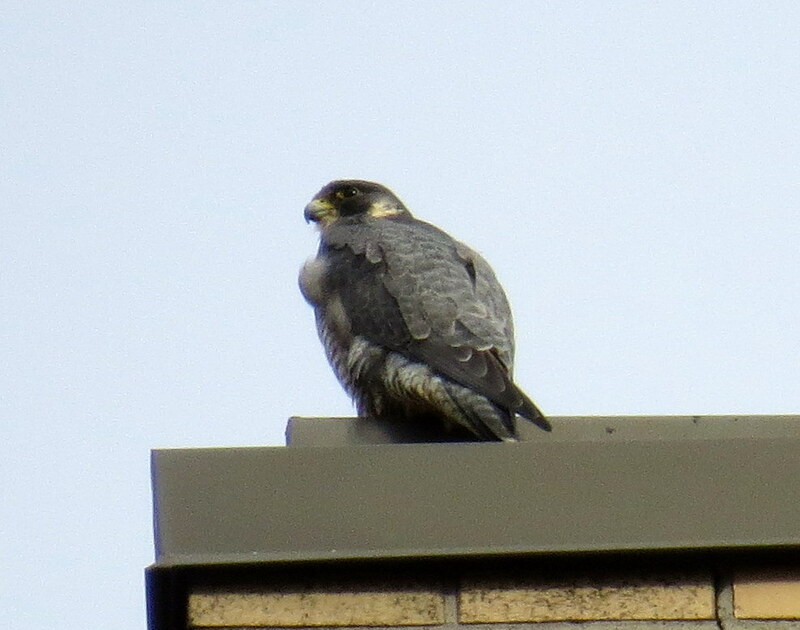 When I finally got home there still were no falcons to be found at Seneca Towers or Hawkeye. 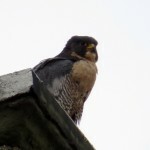 Not sure when I’ll be out for a watch again but I’ll keep smiling if you all do! 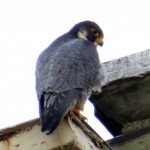 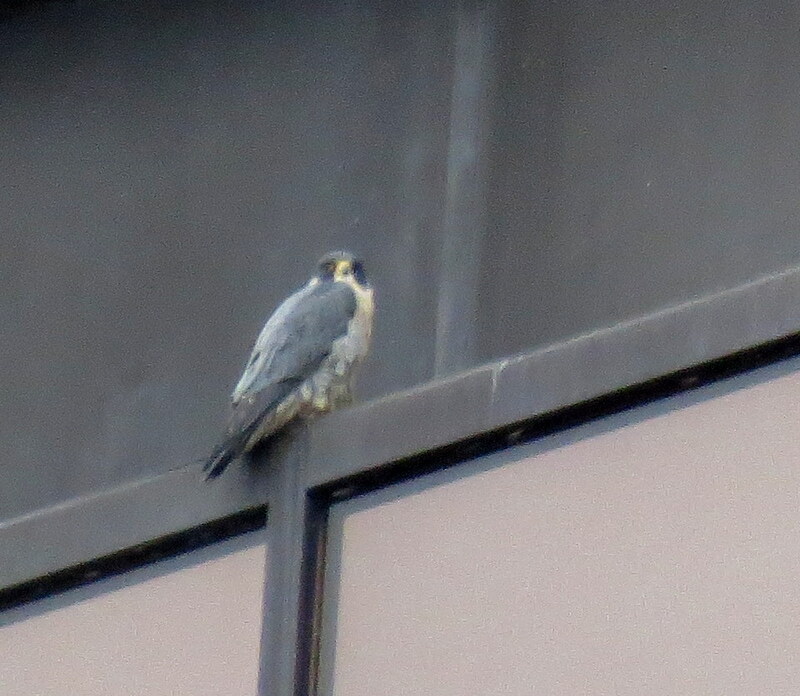 Many of the watchers have been checking the Hawkeye Plant (HE) in Rochester since a different pair of falcons were sighted there. 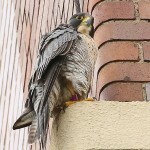 Dana and MAK confirmed the male is unbanded, and the female is from the midwest because she has a purple USFW band on her right leg and a black over red band on her left leg. 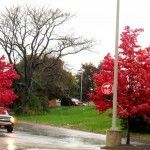 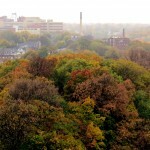 It was mid-afternoon on Oct 21st with gray skies and periodic rain drops. 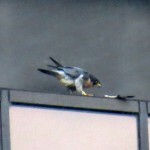 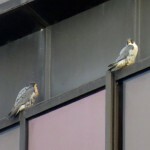 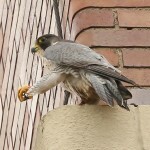 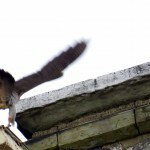 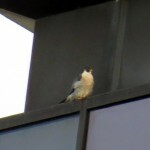 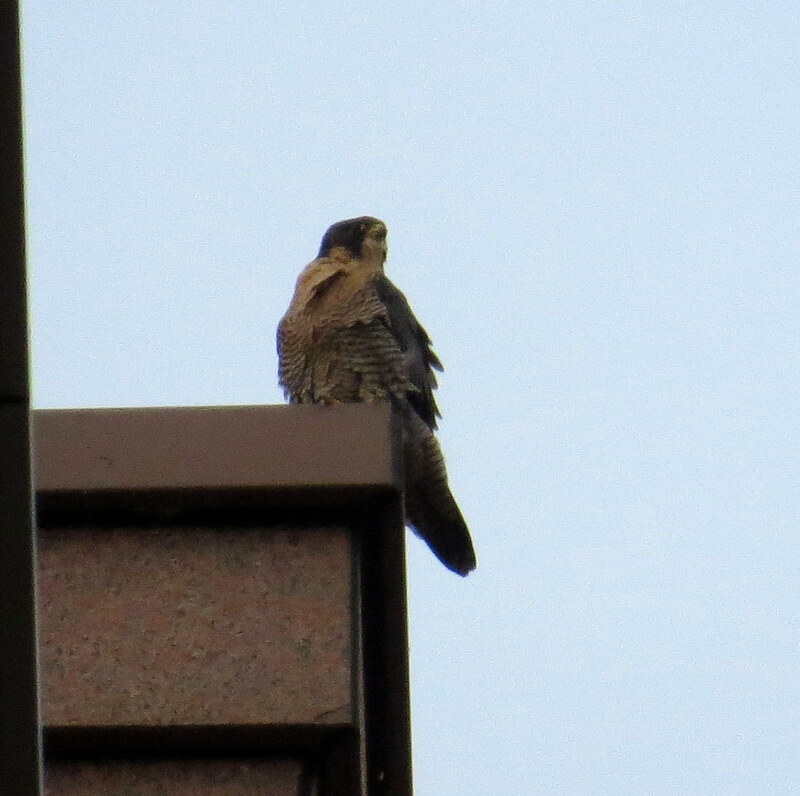 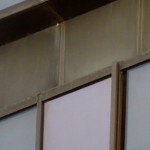 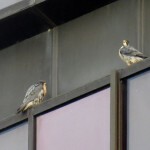 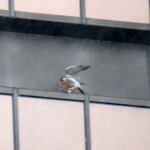 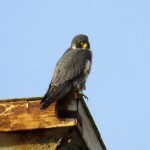 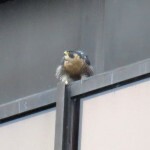 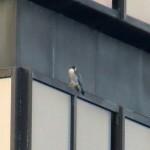 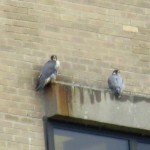 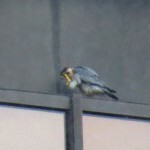 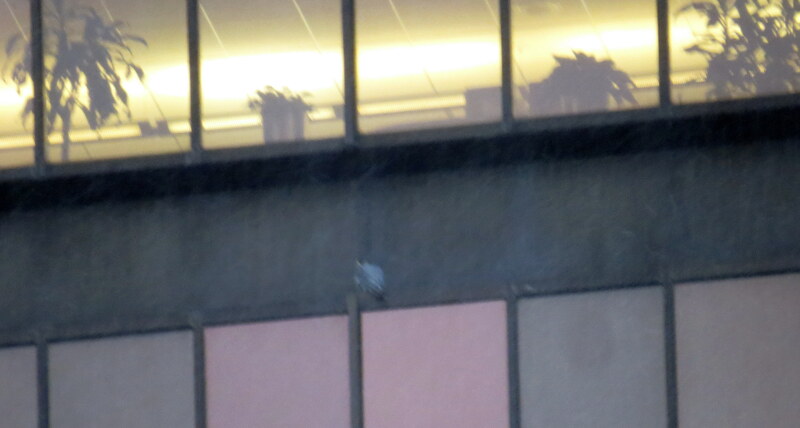 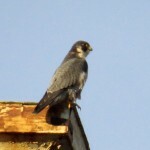 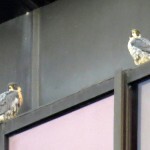 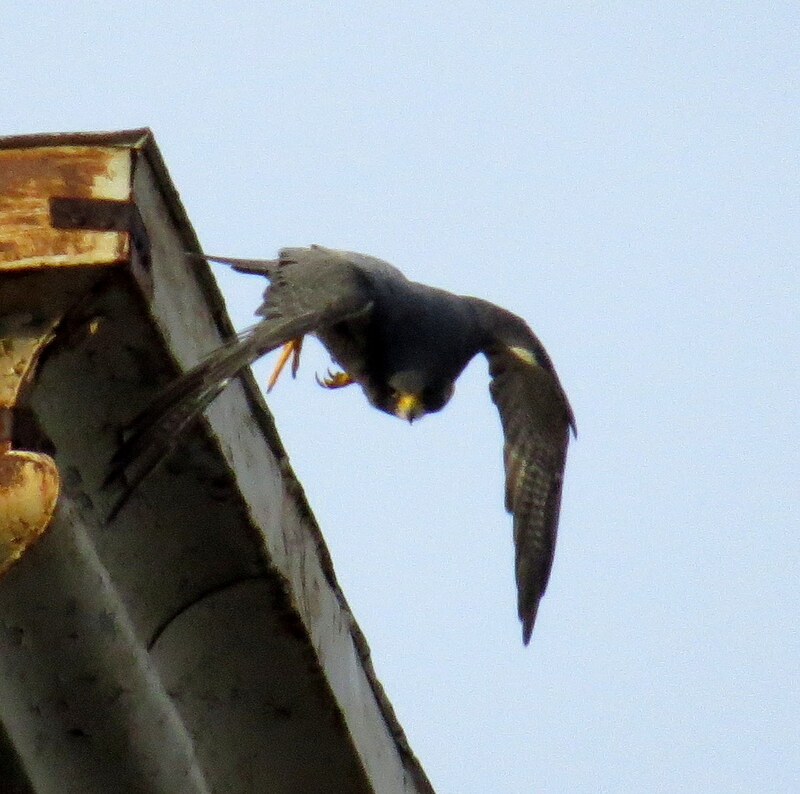 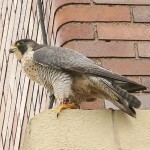 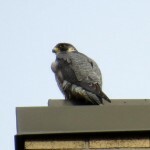 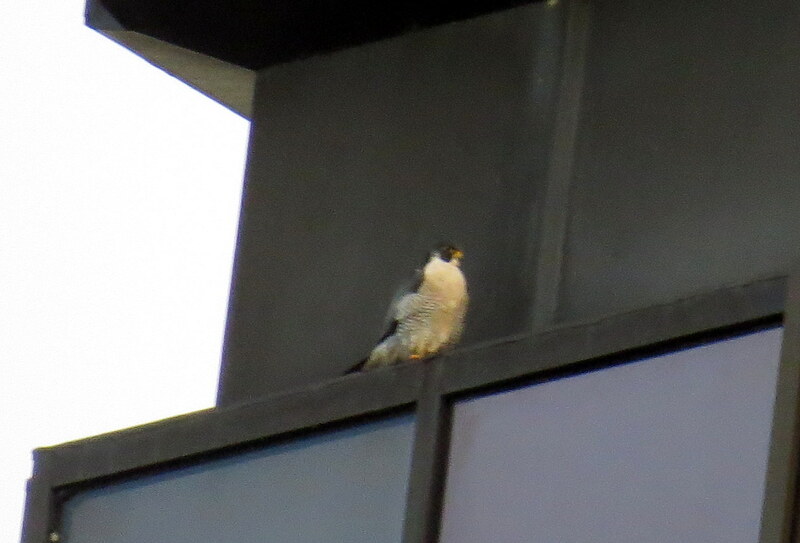 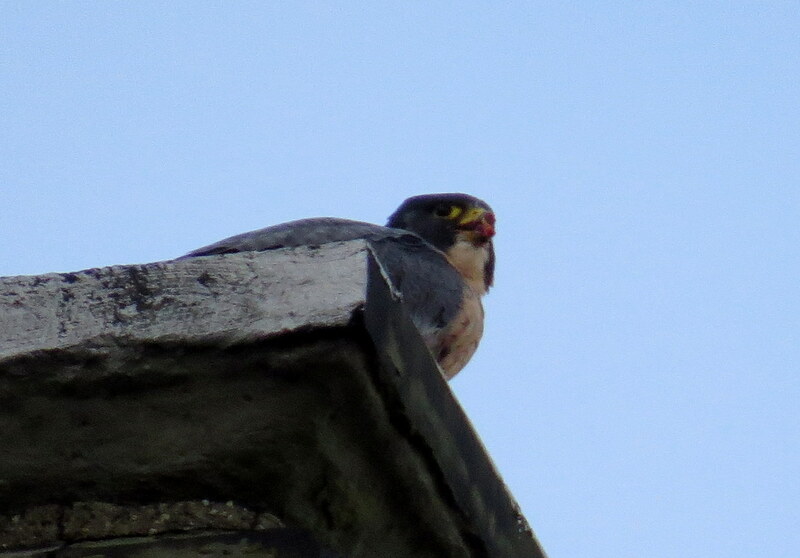 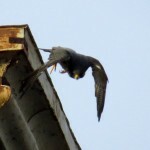 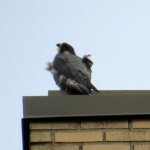 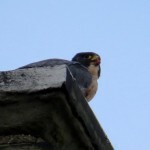 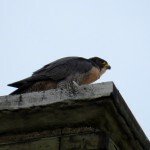 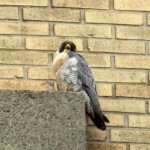 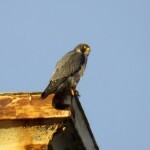 I began watching the female peregrine on the north side of the building. 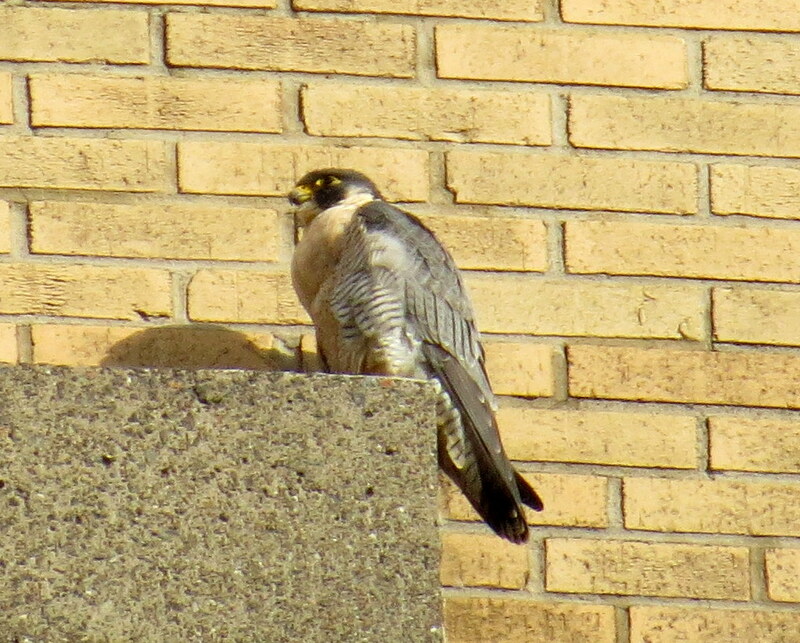 She was 2 levels down from the roof on a corner ledge. 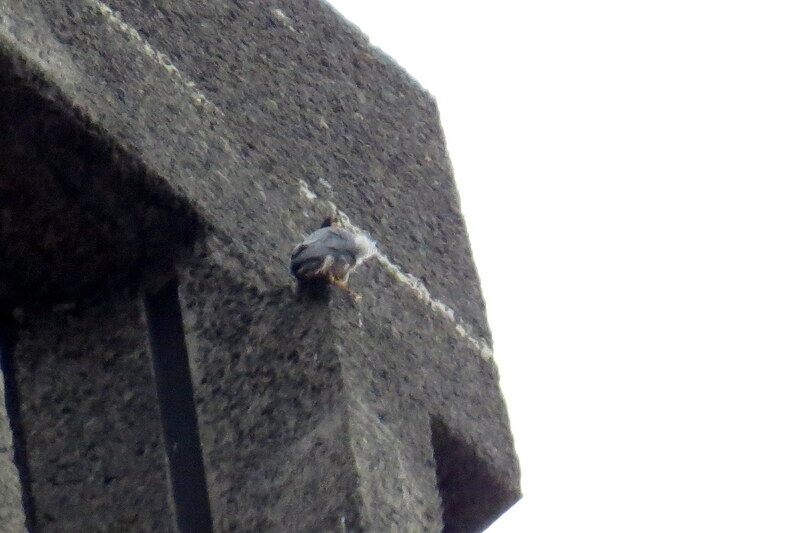 There was no sign of the male. 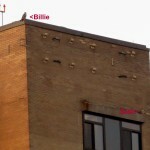 I checked Seneca Towers (ST) to be sure it wasn’t Billie. 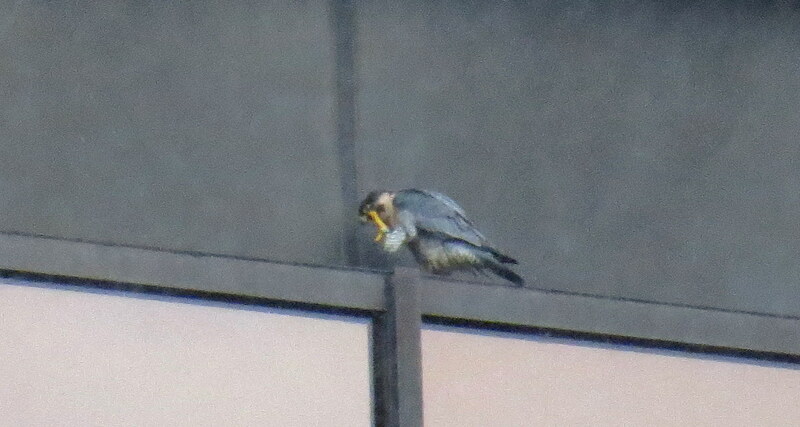 I brought out my chair and waited patiently for a glimpse of a band. 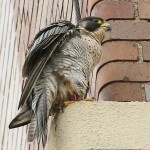 While she was preening, I confirmed the purple band. 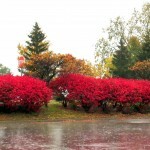 It began to rain and she turned around. 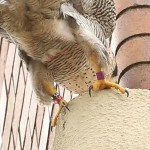 She stretched her leg, but her feathers still covered the band. 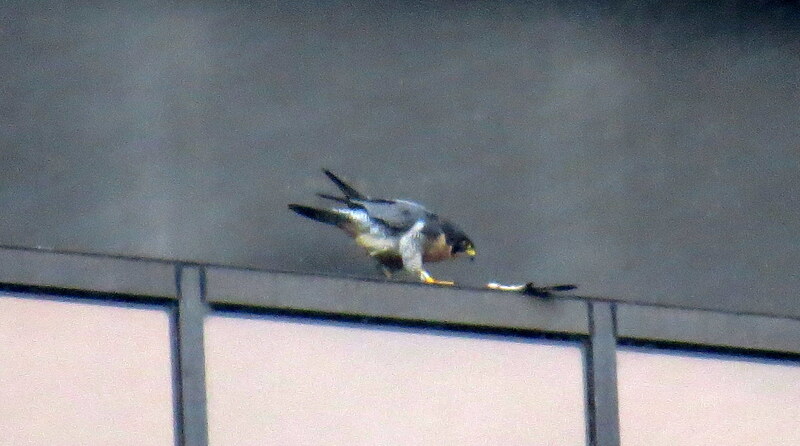 FINALLY…I caught a clear photo of the left leg band 54 over V, black over red as she turned back around. 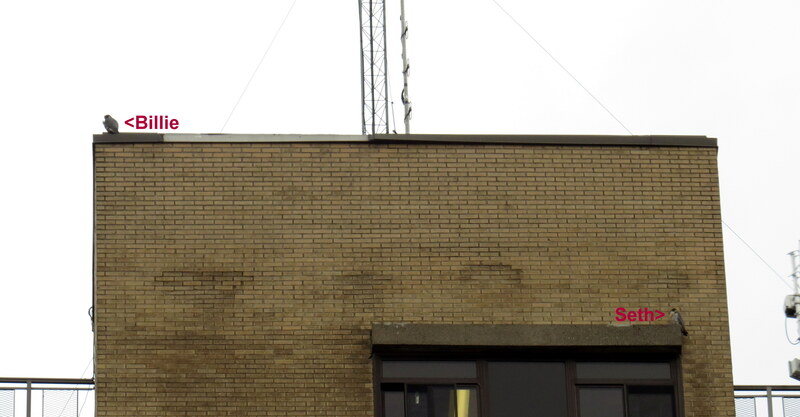 Notice the distinct markings on the front of Buckee. 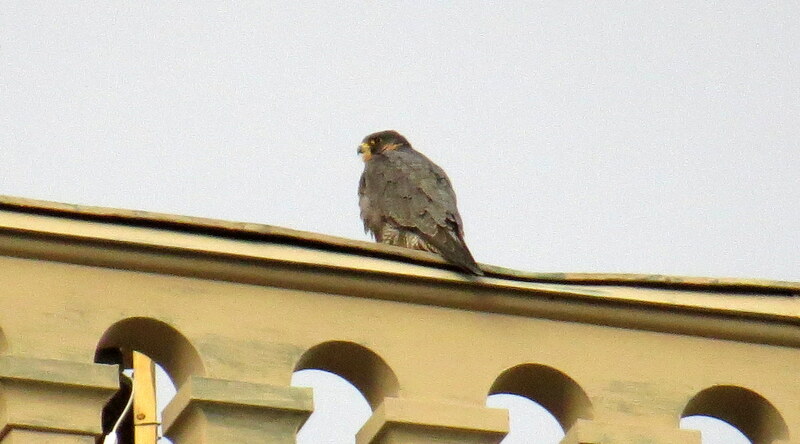 The spot markings on the chest, also extend into the white auricular patch behind the malar stripe (mustache). 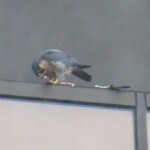 She still has some brown subadult feathers. 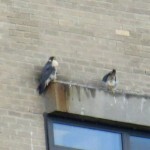 The Seneca Towers Peregrines have been scarce the last few days and I’m hoping all is well since that new pair has been hanging out at Hawkeye just half a mile from here. 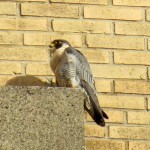 I haven’t seen a falcon there in the last few days either. 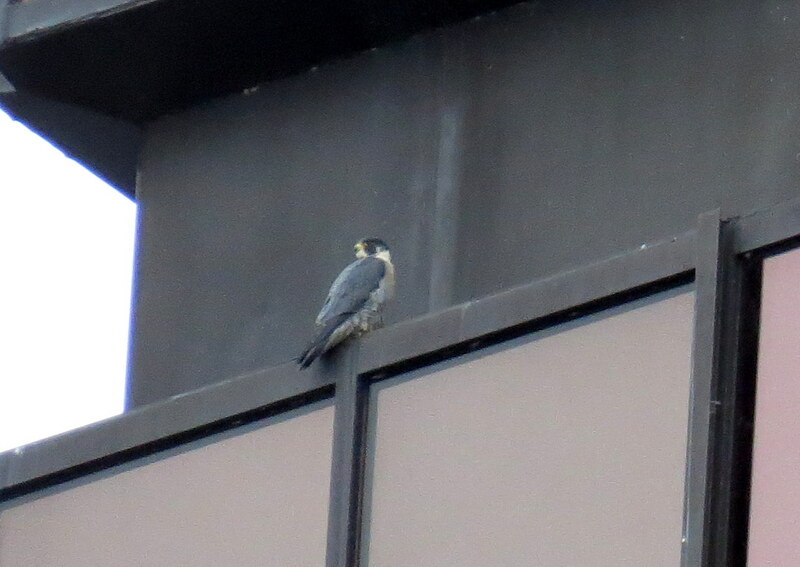 This morning after 2 days of seeing nobody here, I spotted one on the northwest corner railing from below in my parking lot here at Seneca Towers. 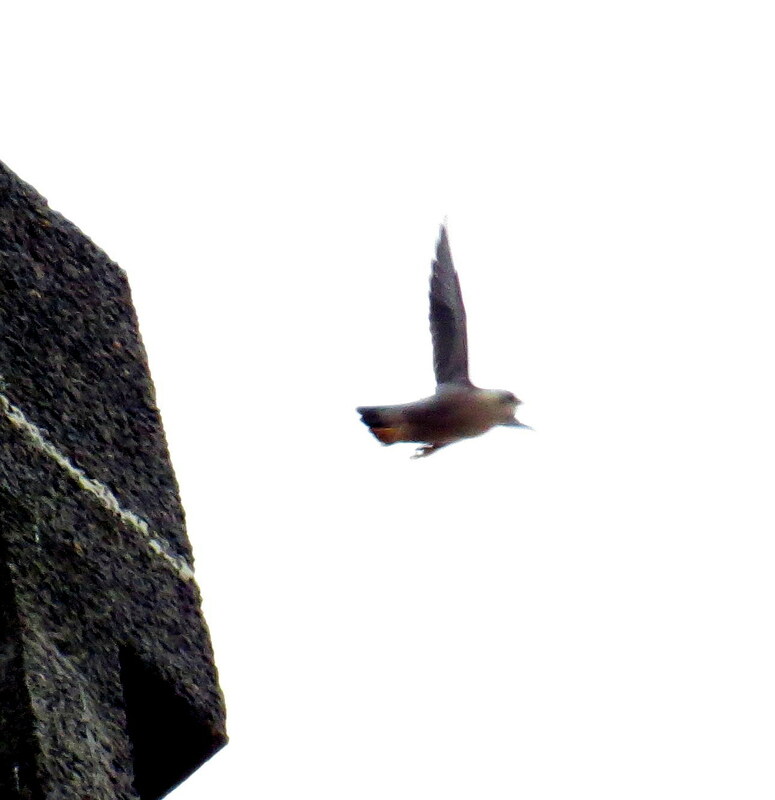 It soon turned around and flew east-there was no way of telling who it was. 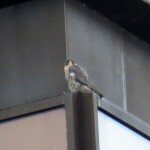 I proceeded to check the rest of the building to no avail and then headed downtown past Hawkeye where I could see no falcons. 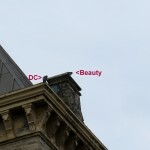 After one trip around I found Beauty and Dot.ca (DC) on the southeast side top I-beam of OCSR from the Broad St. bridge. 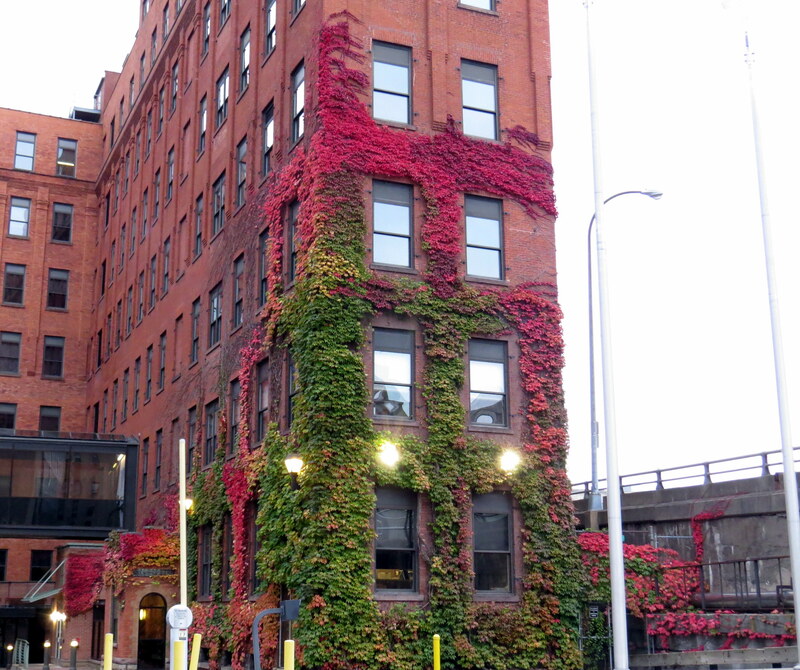 I drove over to the Radisson Hotel by Main St. for a closer look. 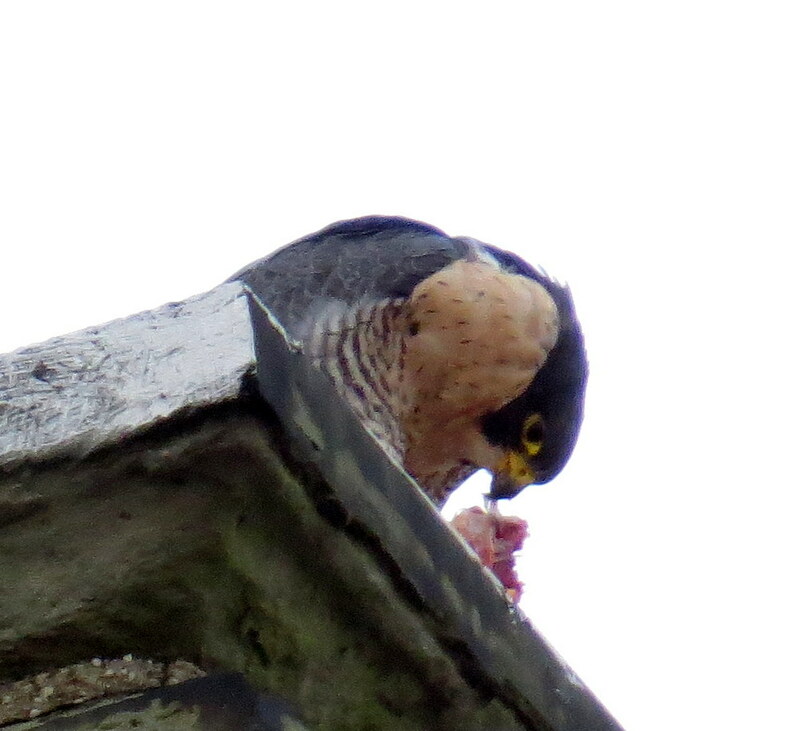 Beauty was feaking so I assumed she had just finished eating as DC had his back facing out. 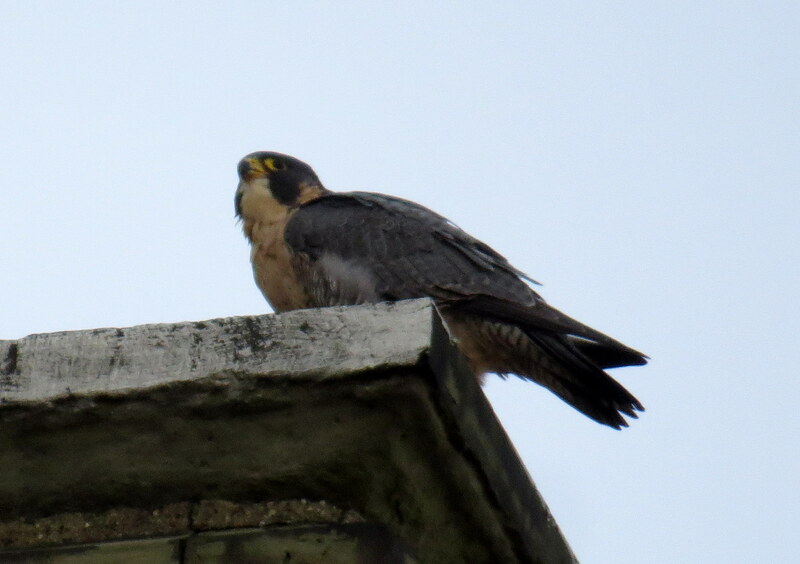 The Beautyful one turned around a few times and did some more feaking in the process then settled down as DC looked over his shoulder. 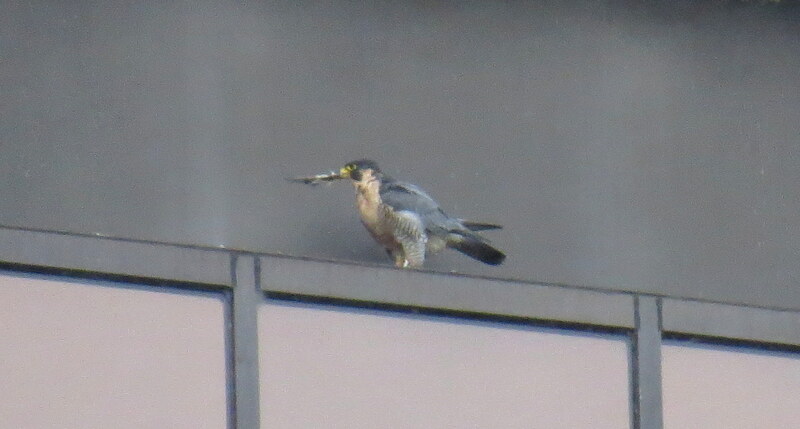 I couldn’t see his crop so I couldn’t say whether he had eaten or not but all was quiet when I left them at 8:15am to go check the Brighton site (BS) where an unidentifyed female has been seen this past week. 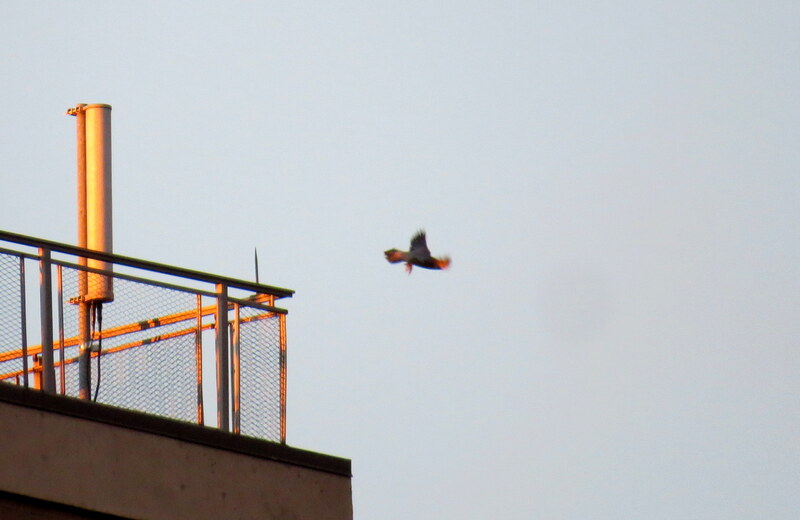 On my way over Larry had tweeted that he and his dog Harold were checking at BS. 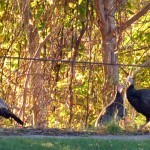 When I arrived I found them as well as the “Core Four” as Joyce refers to them, which includes Lisa, Dana,KathyO and CarolP. 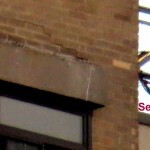 They were checking the site before leaving on a road trip to Canada. 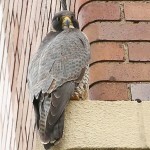 There was no falcon to be found at this location today. 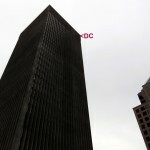 We all headed out and I went to the Medley Center. 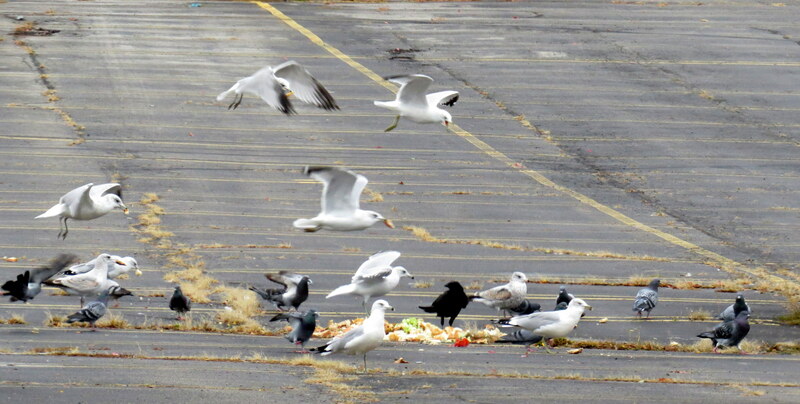 All I found there, was a big pile of bread in the north side parking lot being devoured by crows, pigeons and gulls. 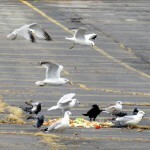 At one point a crow squawked and carried on so much that the rest of the crowd left, but they soon came back for more. 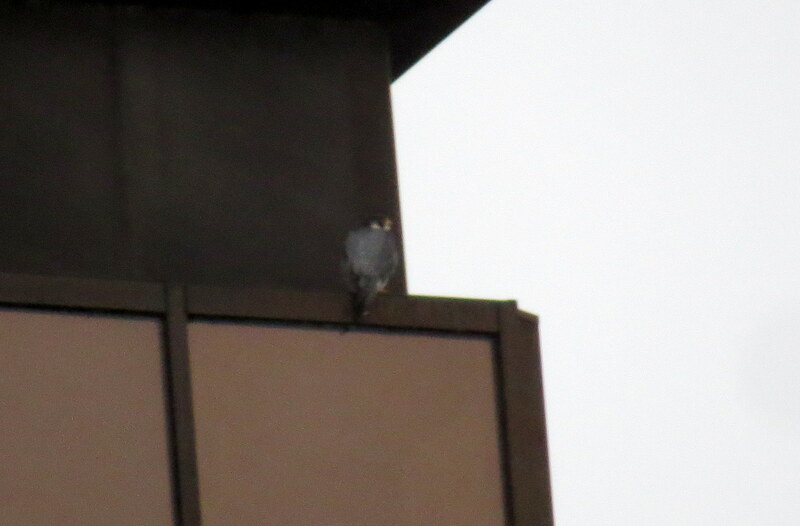 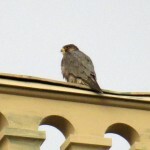 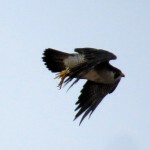 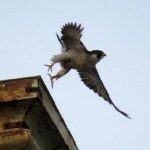 I headed for home after waiting there half hour or so but again there were no falcons seen at Seneca Towers. 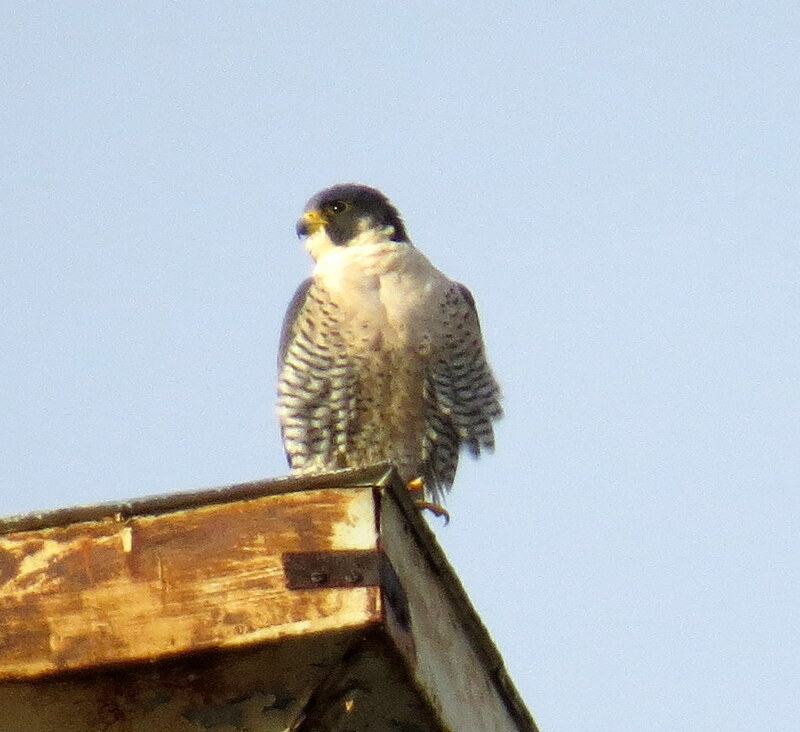 I ended my watch just before the 10 o’clock hour smiling for I had seen one more falcon today than I had yesterday. 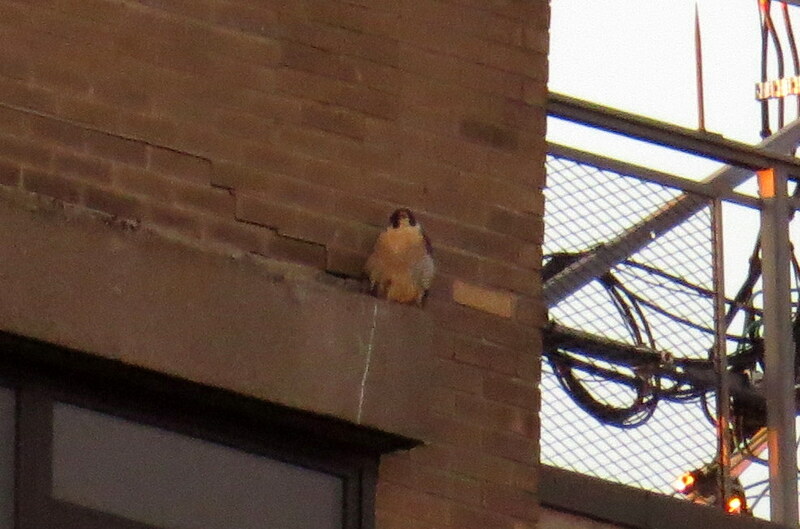 I started my watch at 7:30am and didn’t see a falcon at Seneca Towers or Hawkeye. 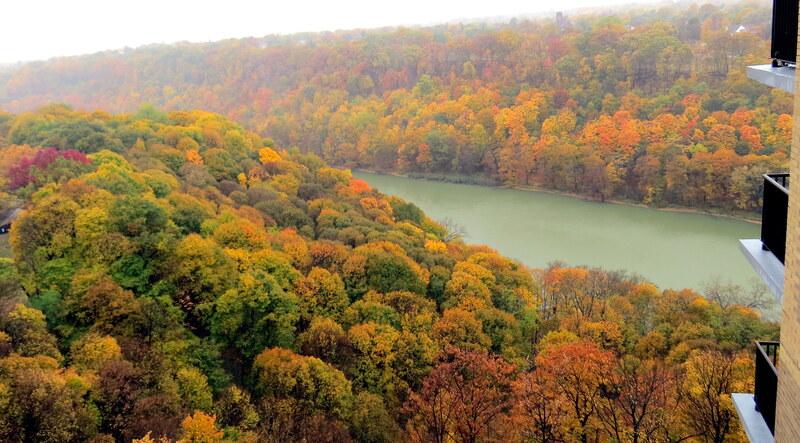 After a couple trips around downtown I was starting to wonder if I would see a PEFA today, so I occupied myself by taking in the fall colors and the Genesee River, which was pretty mellow this morning. 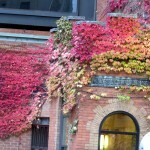 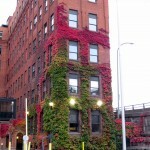 The ivy on the Thomson Reuters building was especially pretty. 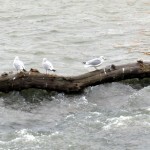 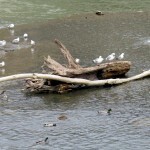 The gulls were enjoying the various trees in the river for gathering and preening. 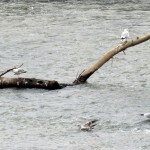 It’s funny how they’ll get on those trees but I’ve never seen a gull in an upright, live tree. 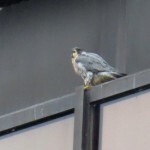 Finally at about 8:15am, while I was on the Court St. bridge I checked one of Dot.ca’s (DC) hunting spots and I could barely see him up there on the north side first column from the northwest corner. I drove to the Legacy Tower circle where I had a better and closer angle on him. 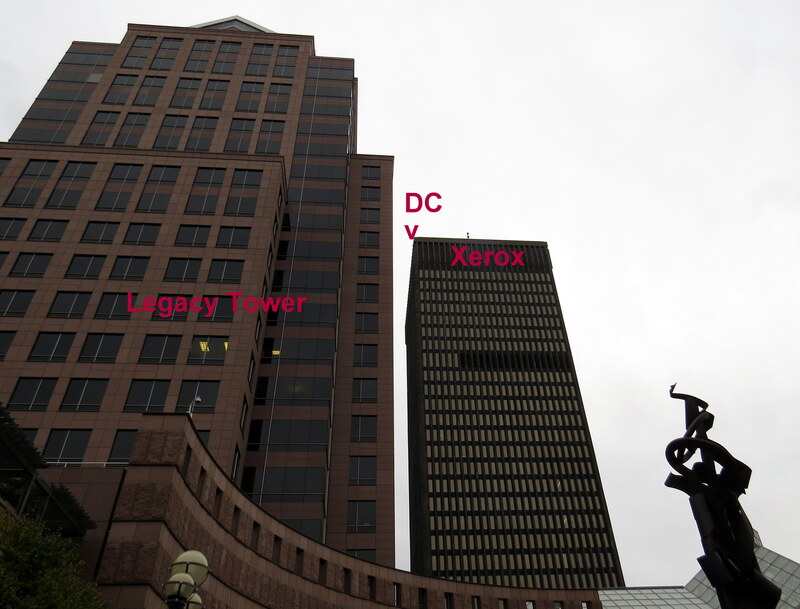 After a while I took a ride around to search for Beauty but had no luck so I went to Elm St. behind Midtown to watch DC from the north side of Xerox. 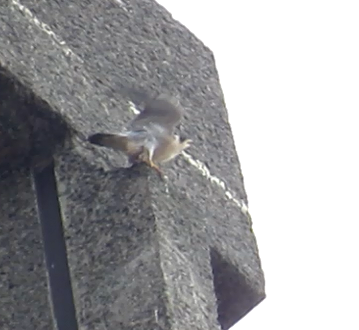 At 8:37am DC flew to the north in a big hurry-he may have been hunting. 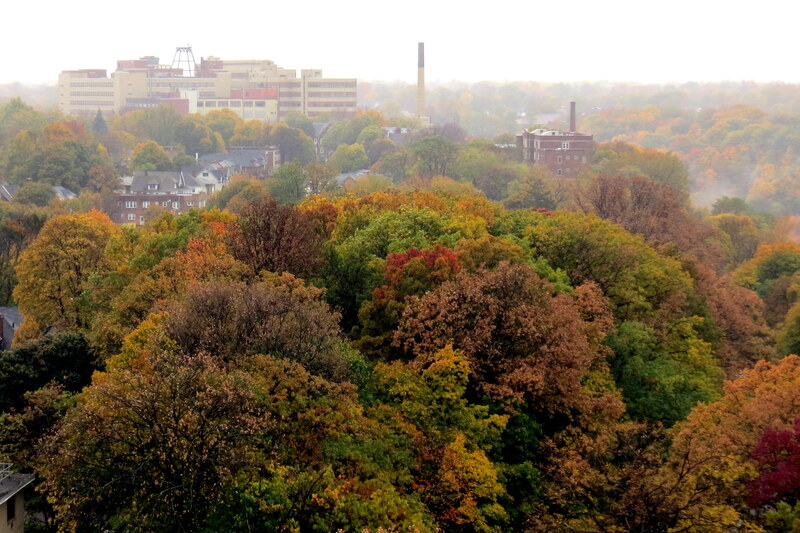 I never did find another PEFA-not downtown, Hawkeye, Medley Center or Seneca Towers. 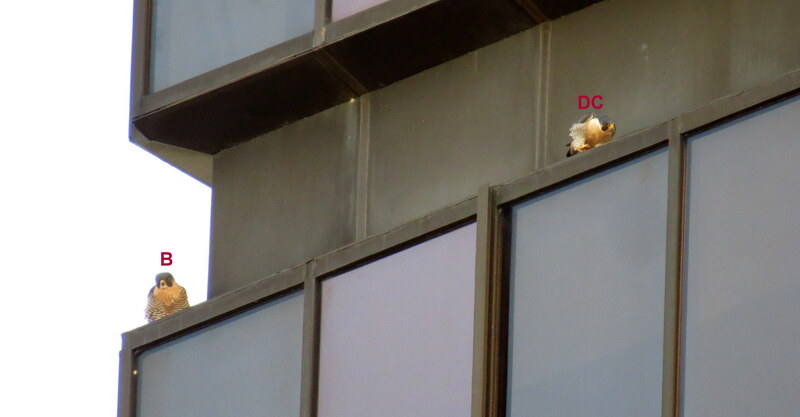 That didn’t stop me from smiling as I ended my watch around 9:45am because I saw DC and that’s more than a lot of people get to see! 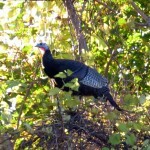 I started on East Ridge Rd. 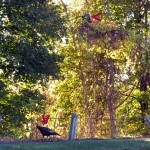 with Seth and Billie in my sights. 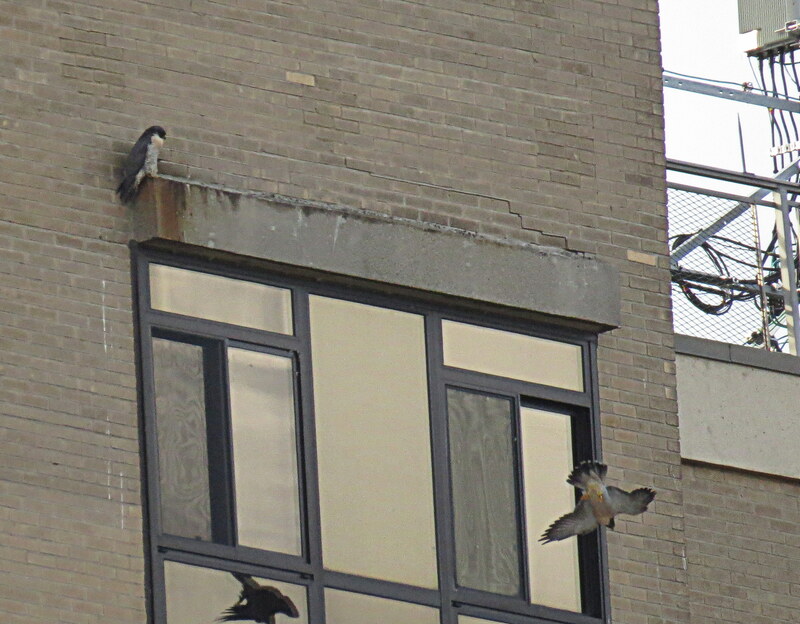 She was on the north end roof and Seth was below on the north window ledge. 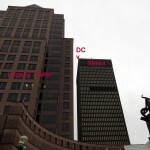 I left after a few minutes and headed downtown where I found Dot.ca (DC) on the top I-beam of OCSR near the west corner. 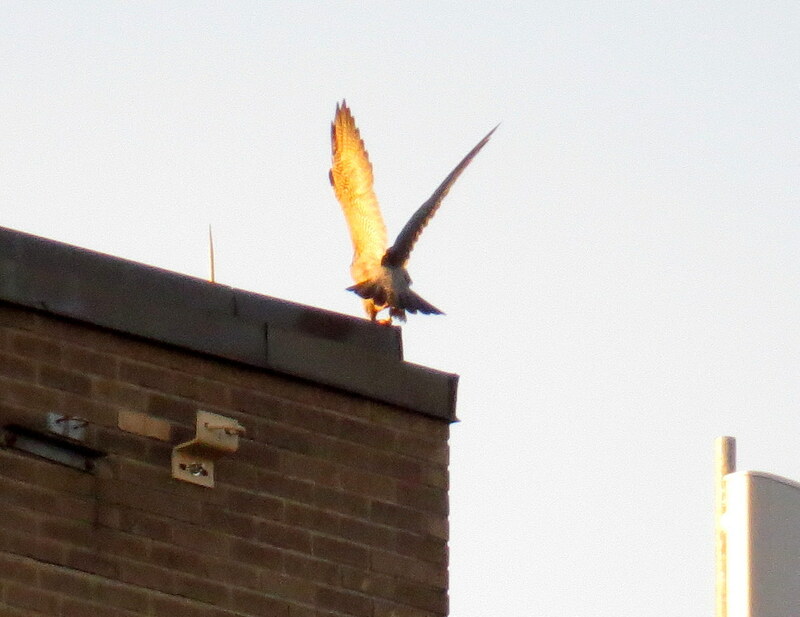 A few minutes later Beauty landed on the corner to join her mate. 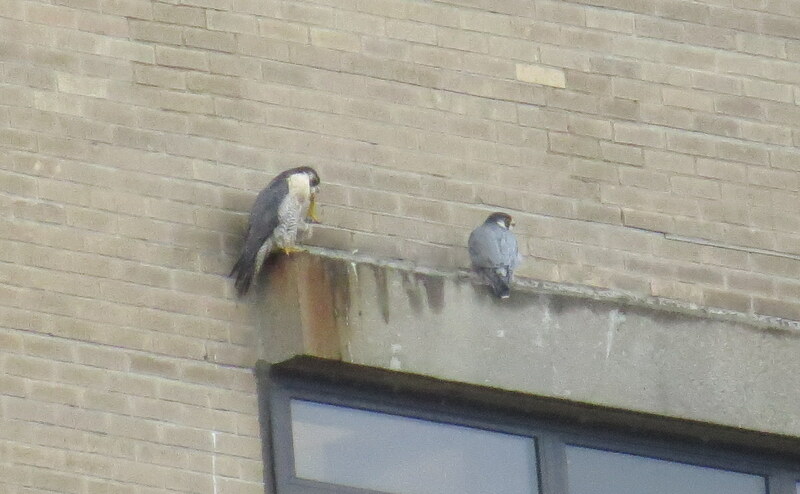 They were pretty close to each other which i love to see. 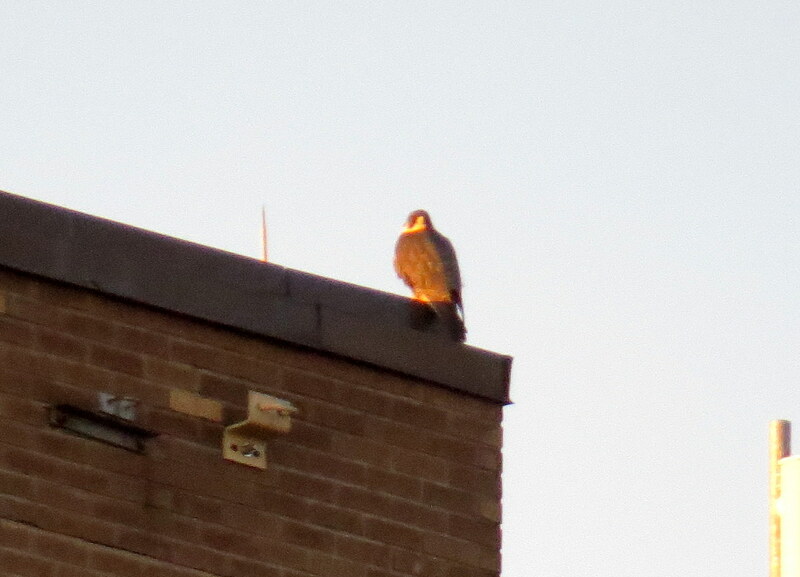 The Beautyful one moved over closer to her mate and turned her back to me. 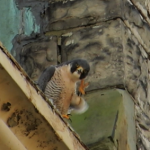 I could that DC had a full crop and when Beauty first arrived she started feaking so I believe she was most likely eating before she joined us. 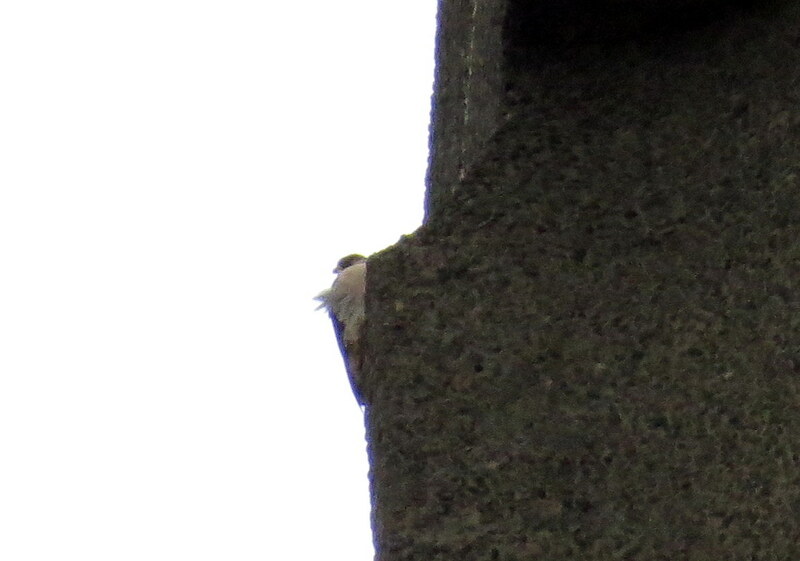 DC changed his position a few times and when I left them his back was to me as well. 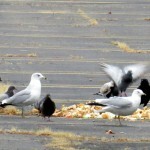 I headed over to the Medley Center where I found nothing but pigeons and starlings. 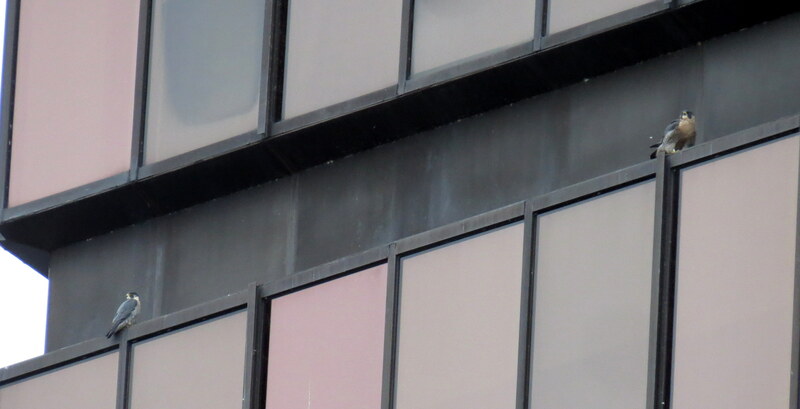 I was having phone issues so I opted for ending my watch to go take care of that at 9:15am. 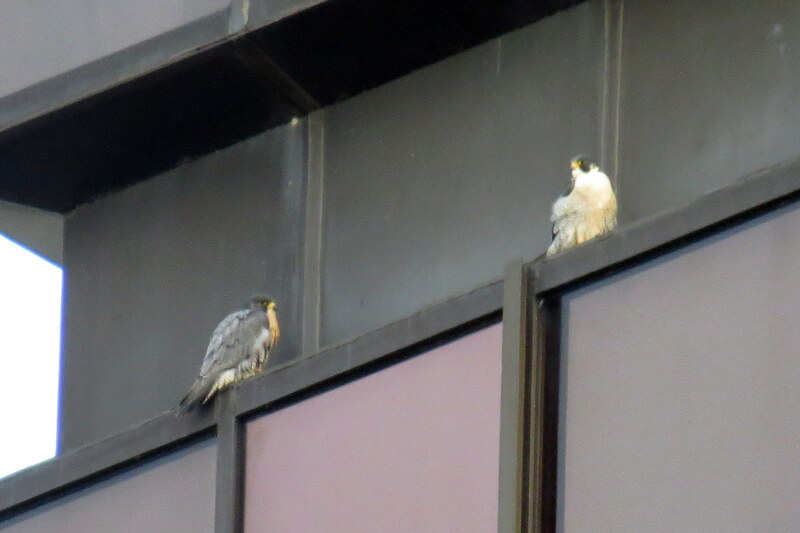 Seeing our resident pairs was cause for me to smile! 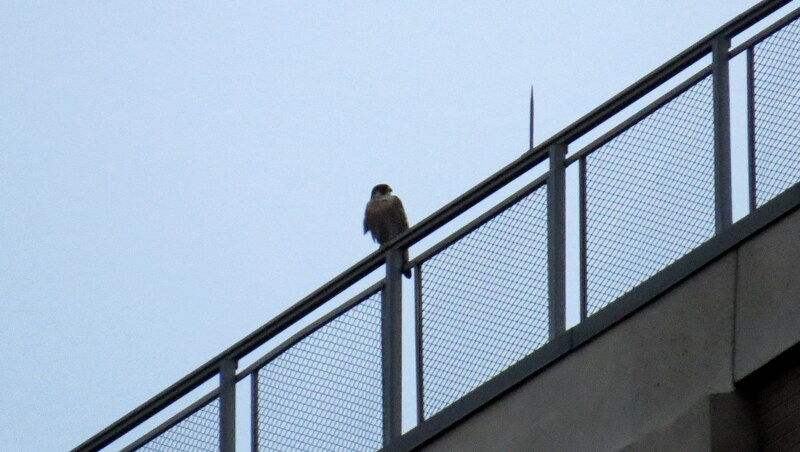 I first checked the north end of Seneca Towers from the back of my parking lot where I could see a falcon on the northwest corner railing. 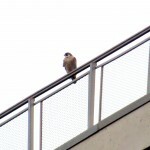 I couldn’t tell who it was so I went out to Seth Green Dr. where I could see another one on the west side railing. 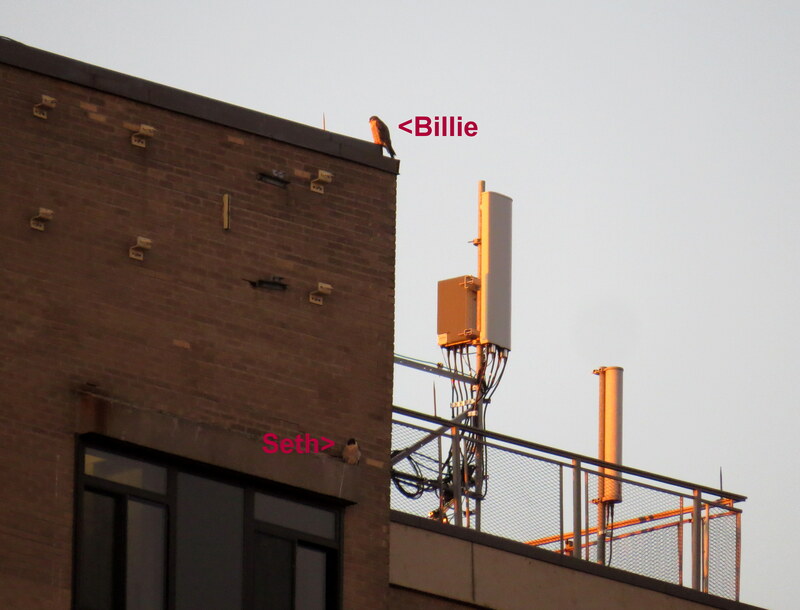 I’m pretty sure Billie was on the corner and Seth on the west side. 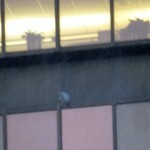 I left for downtown and encountered big time traffic backups at every turn and I was having phone problems as well. 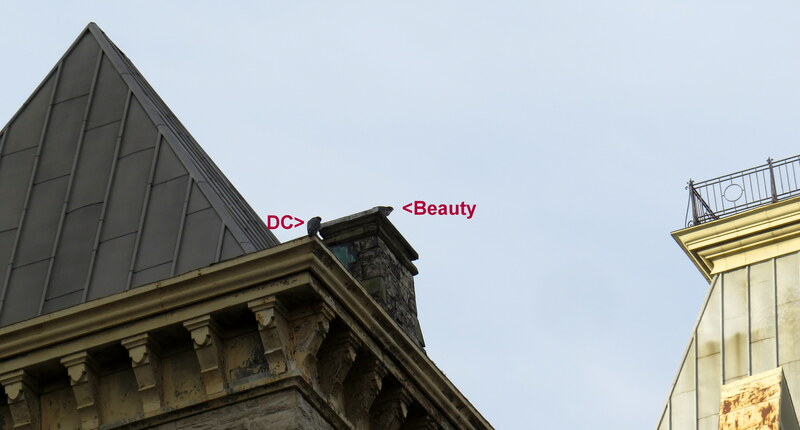 I arrived on the Andrews St. bridge after 8am and found Dot.ca (DC) on the top I-beam near the north corner. I watched him for about 15 minutes then left to look for Beauty. 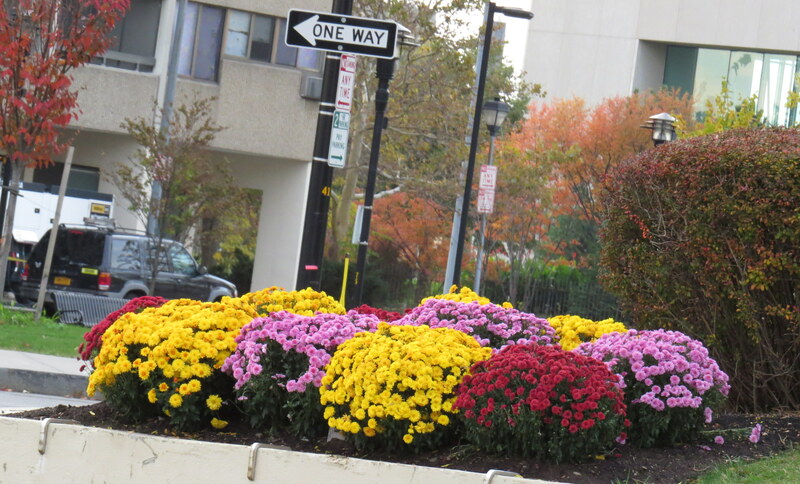 Saw some pretty mums below HSBC and spotted the Beautyful one on one of the northeast corners of the Legacy Tower (LT) while I was stopped at the intersection of Broad St. and Clinton Ave. 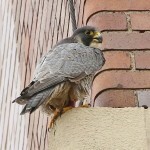 I drove around the corner to Clinton and Elm St. where I could park to observe Beauty as she was in hunt mode. 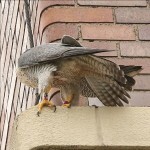 She was watching something below her and the east side where there are many pigeons. 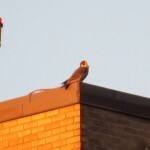 At 8:31am she spotted something to the north and flew off in that direction. 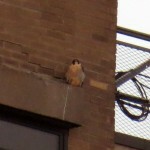 Just before I lost sight of her behind buildings she went into a stoop near the Sibley building. 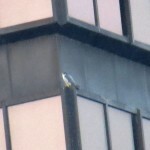 She would be the last PEFA I saw today-after checking downtown, Medley Center, Hawkeye and Seneca Towers unsuccessfully I ended my watch at 9:15am. 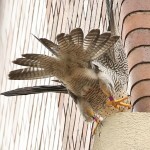 I saw our 2 pair so I was smiling after a very quiet watch!